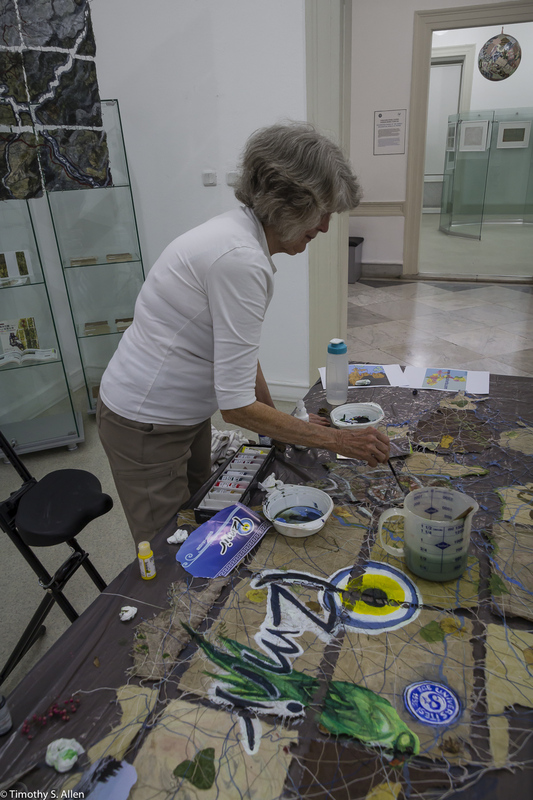 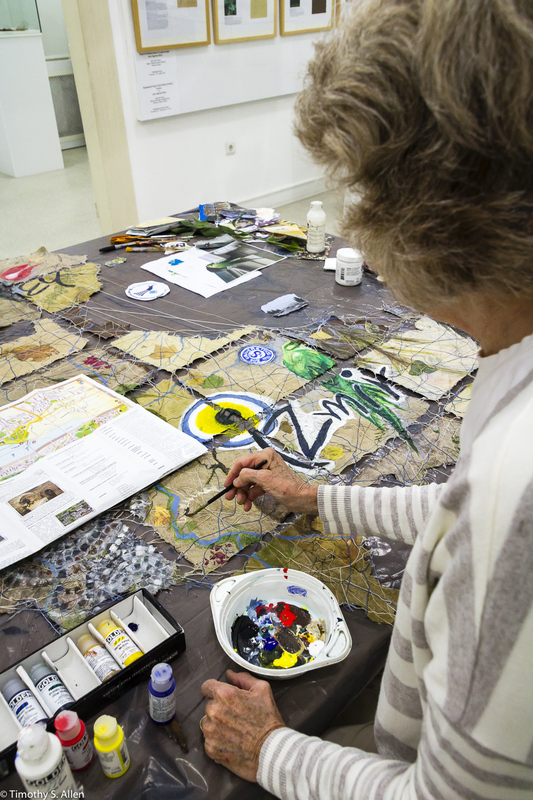 Learn in an environment surrounded by original artworks that were created using the techniques being taught in the workshops. 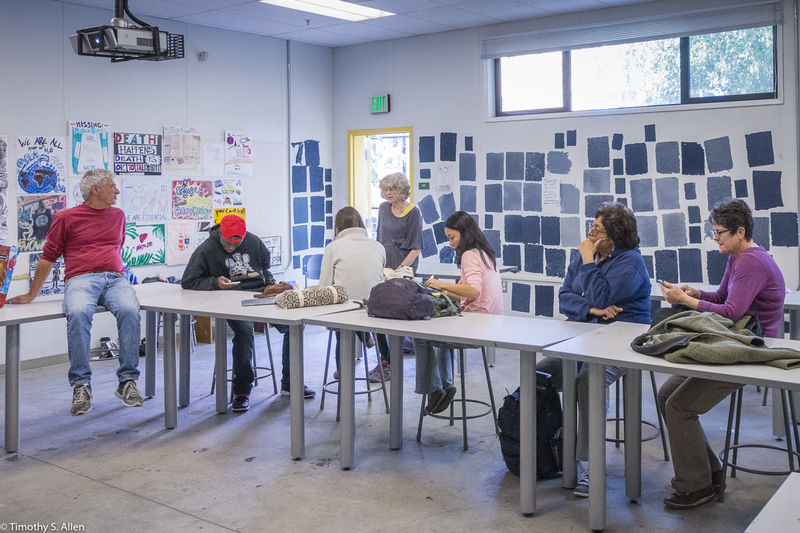 Class size is limited to 4 people, and all materials and equipment are provided. 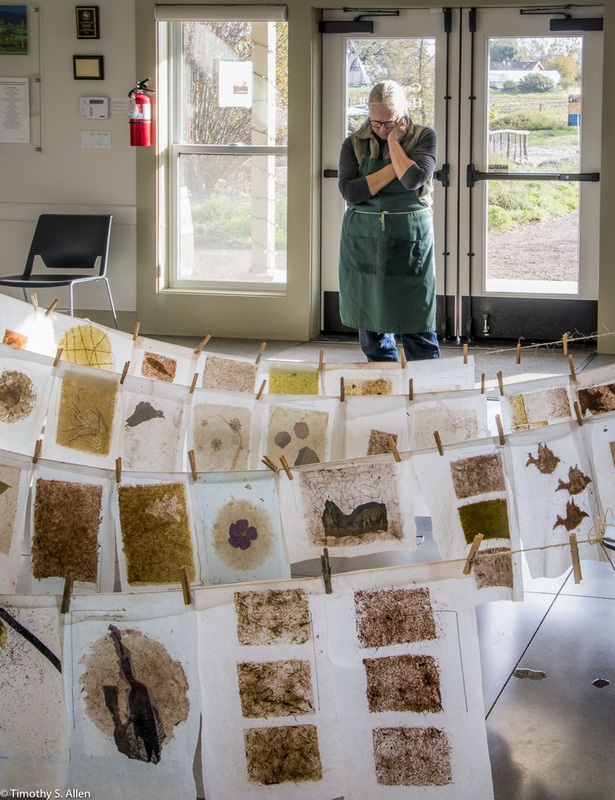 • Award winning international artist and hand papermaking expert with 40 years of experience. 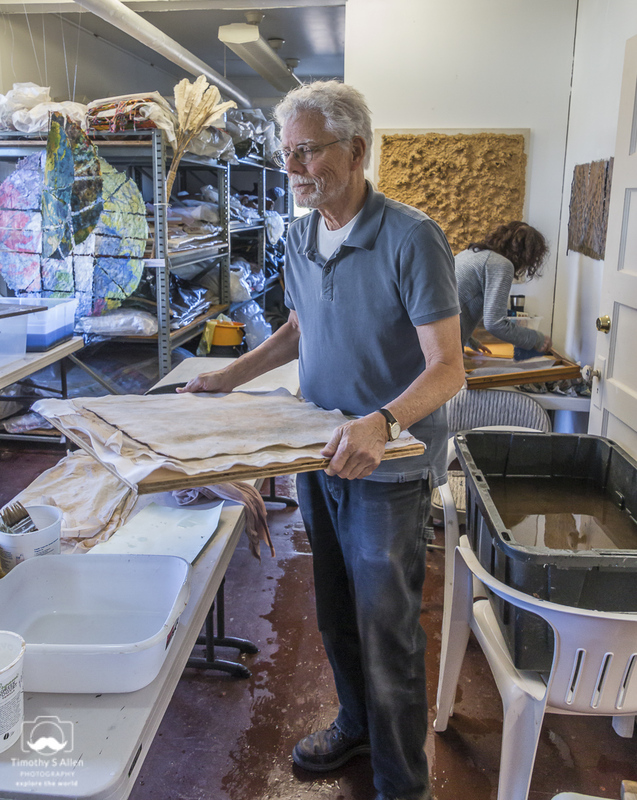 • Papermaking teacher and resident artist in Japan, Taiwan, China, Nepal, Thailand, Indonesia, Turkey, Tanzania, France, England, Brazil, and the US. 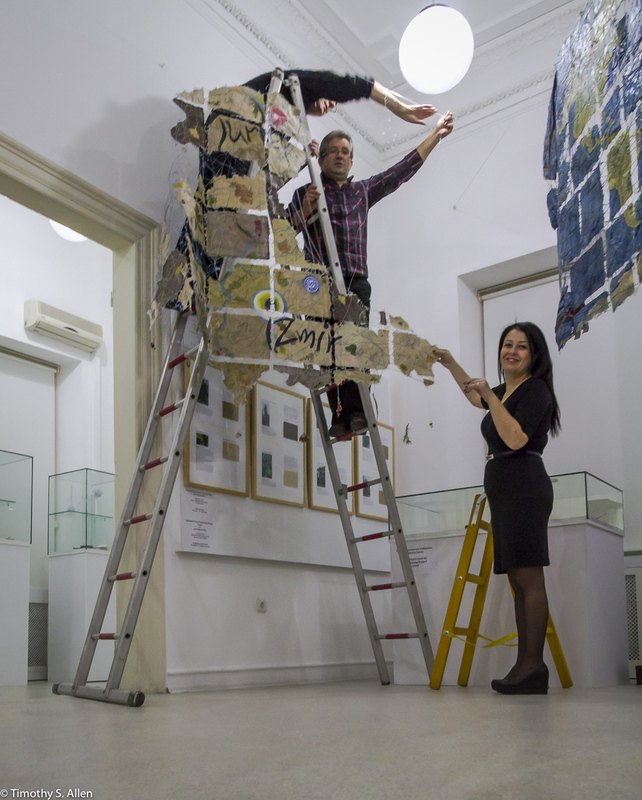 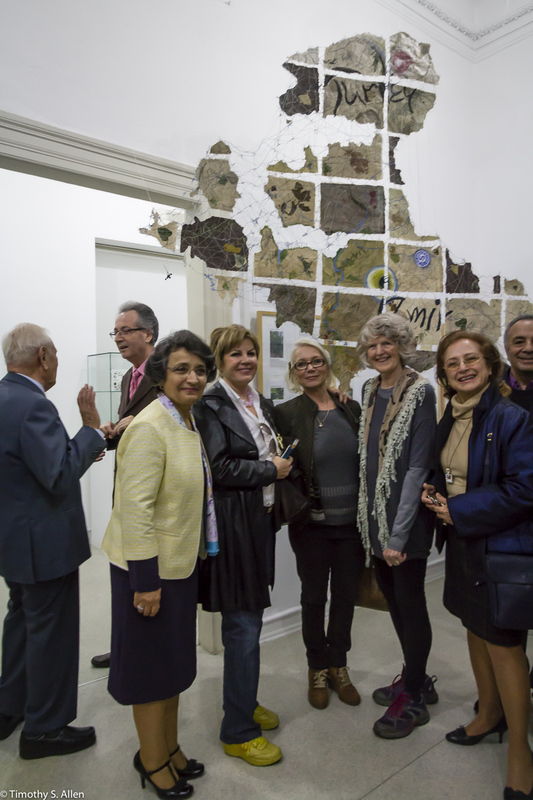 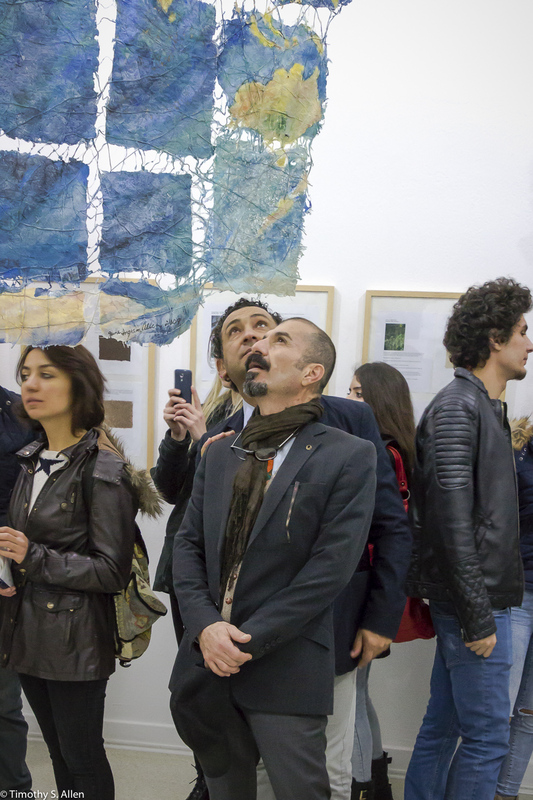 Fulbright Scholar Award artist in Taiwan and Fulbright Specialist artist in Turkey. 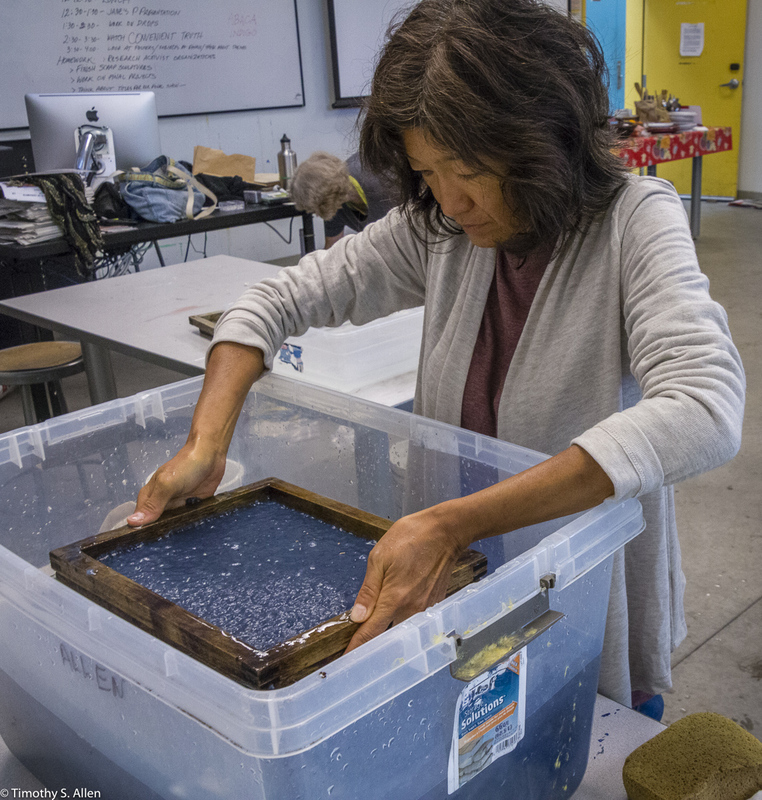 • Trained in traditional Japanese papermaking in Japan, and taught papermaking while living in Taiwan and Asia for 8 plus years. 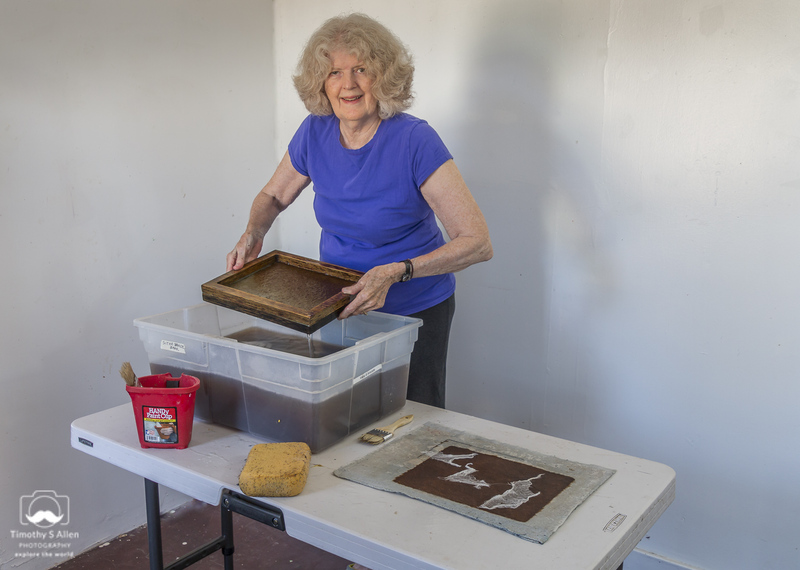 • Former Art professor at SUNY, Morrisville, NY, and College of St. Rose, Albany, NY. 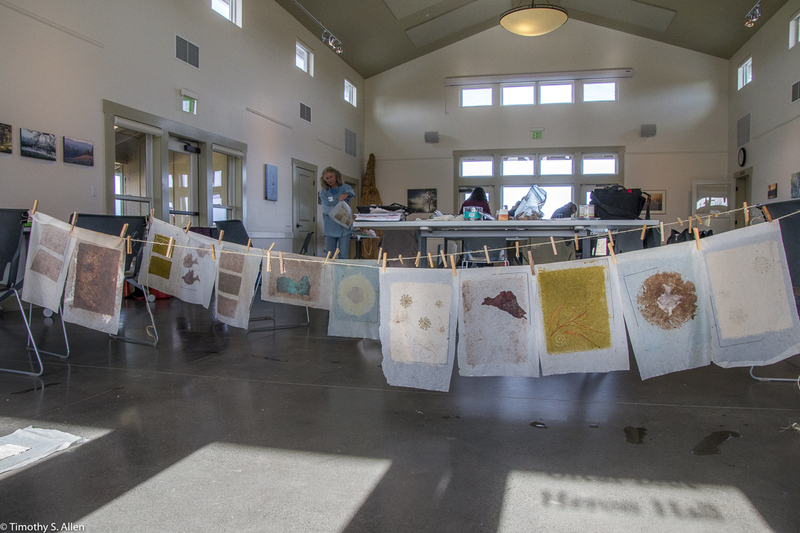 Former textile Arts instructor at Foothill College and Canada College in the San Francisco Bay Area. 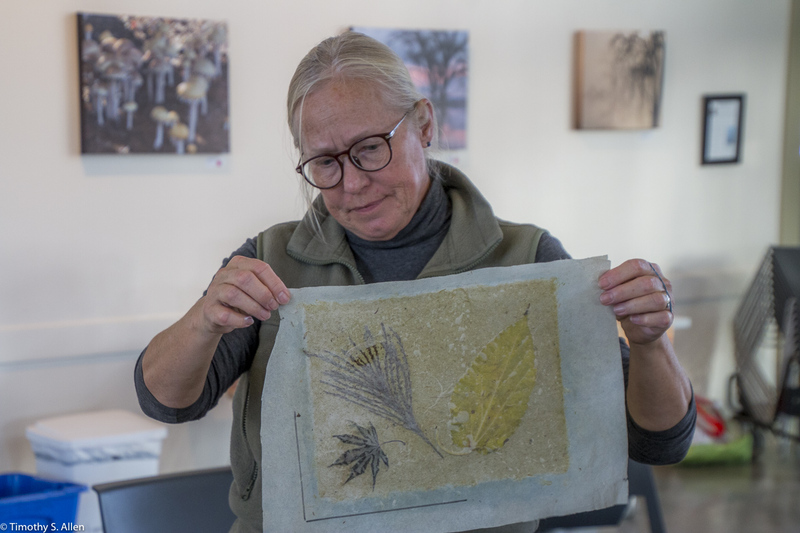 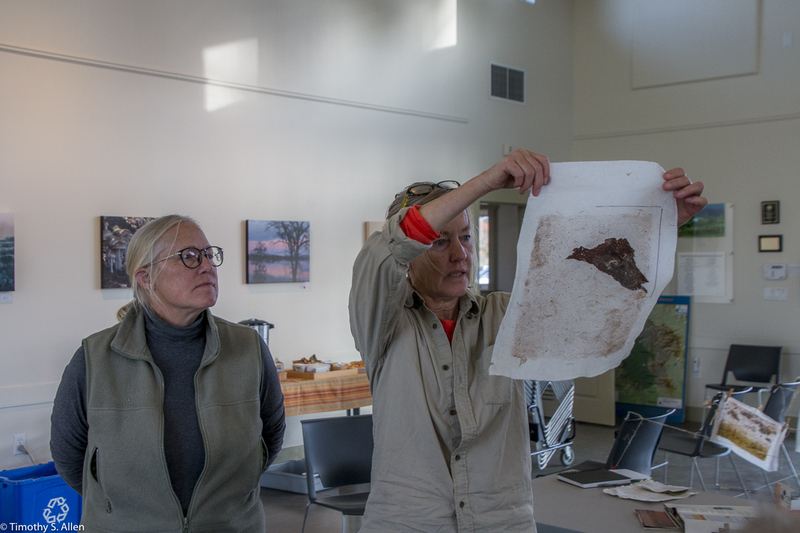 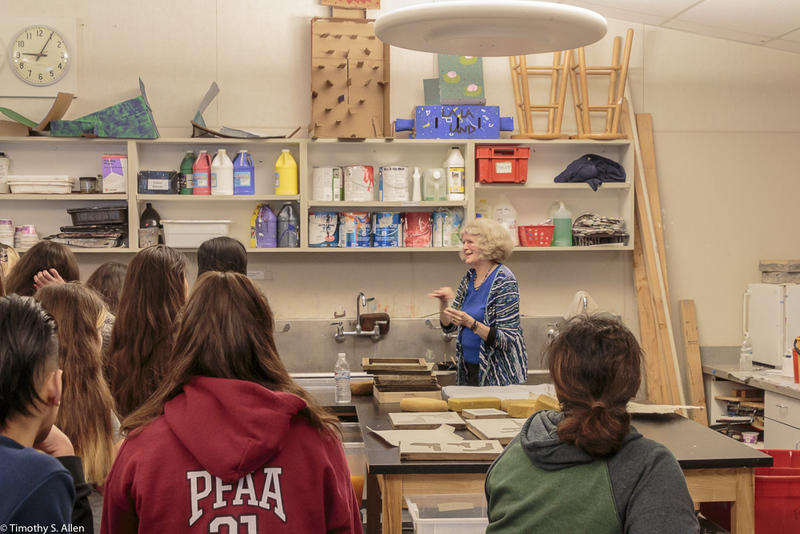 • Taught papermaking workshops in US at Women’s Studio Workshop, Peter’s Valley School of Crafts, Morgan Conservancy, Sitka Center for Art & Ecology, Queens Botanical Garden, Brookfield Craft Center, Mass Audubon and others. 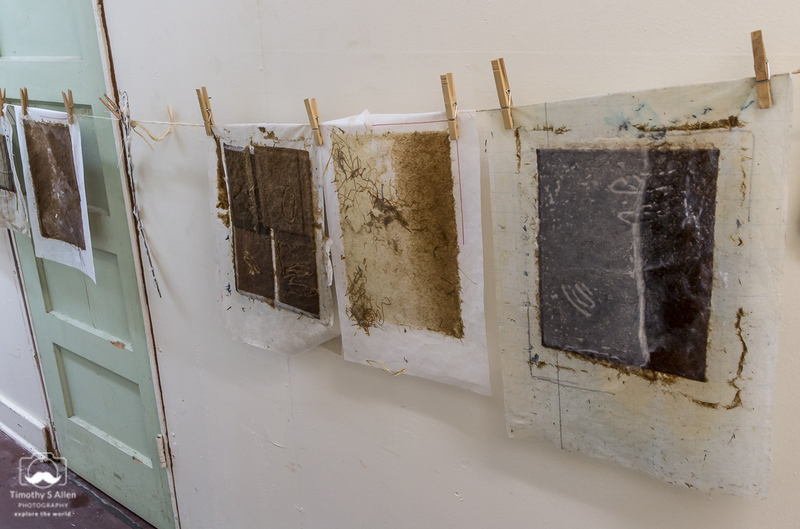 Introduction to Hand Papermaking: Explore Western and Asian techniques of hand papermaking including sheet forming, pressing and drying as well as techniques of laminating, embedding and watermarking. 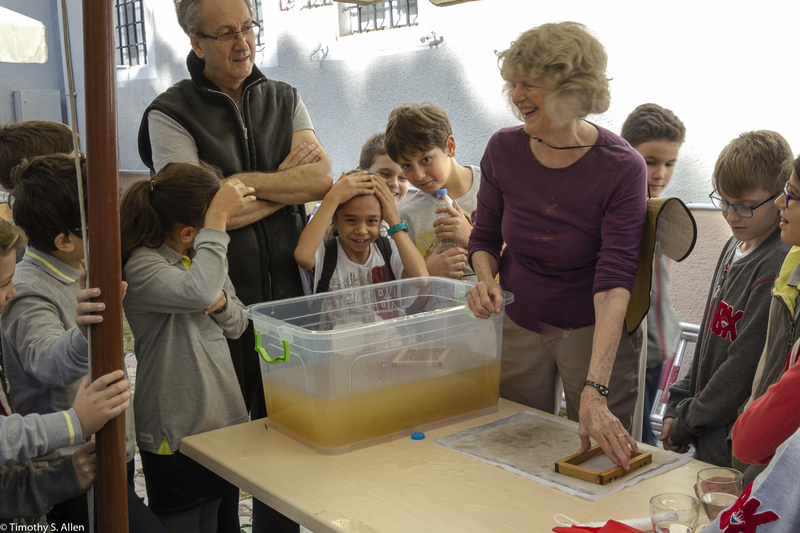 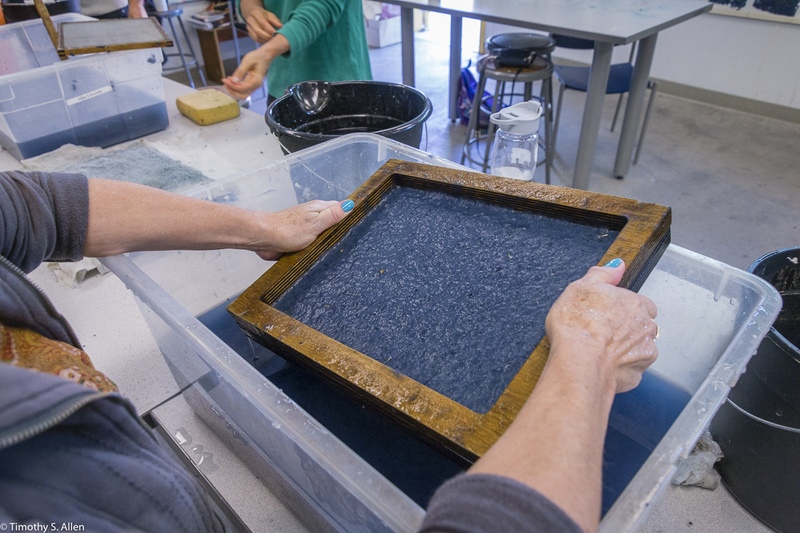 Learn how papermaking can be used for a variety of art creations (2-D and 3-D) and make an array of handmade papers using cotton, abaca, kozo and local plant fibers. 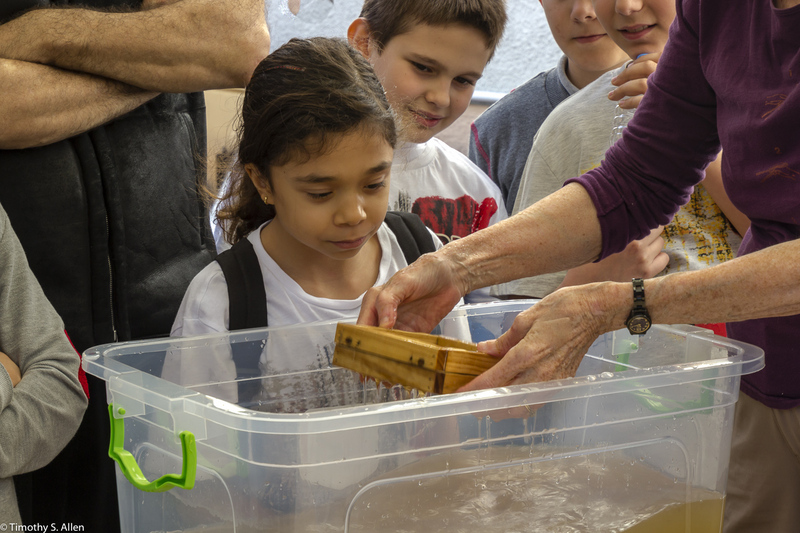 • Saturday, March 30, 10AM to 4PM. 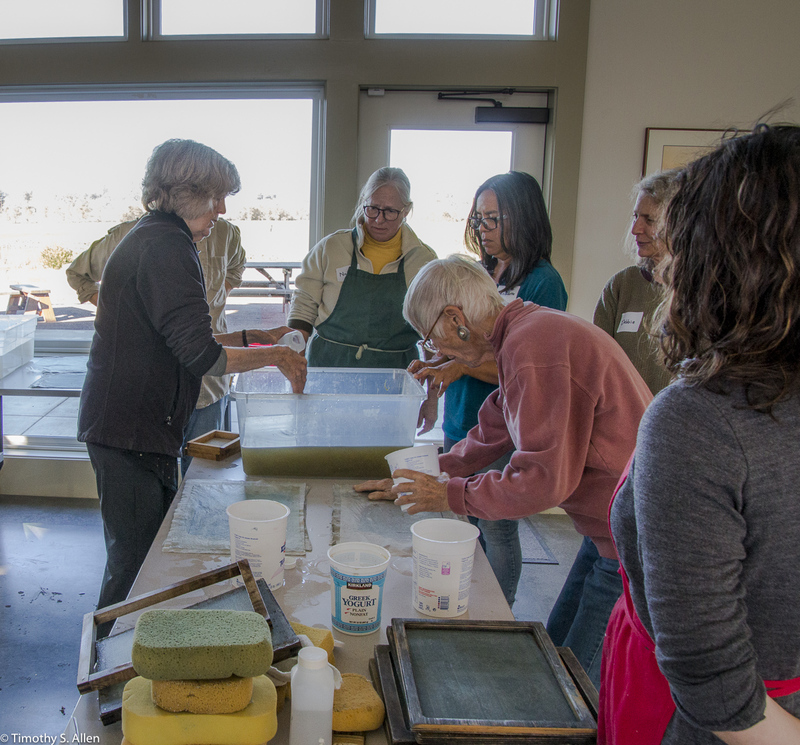 Color and Hand Papermaking: Create your own handmade paper with colored pulps using Western and Japanese techniques. 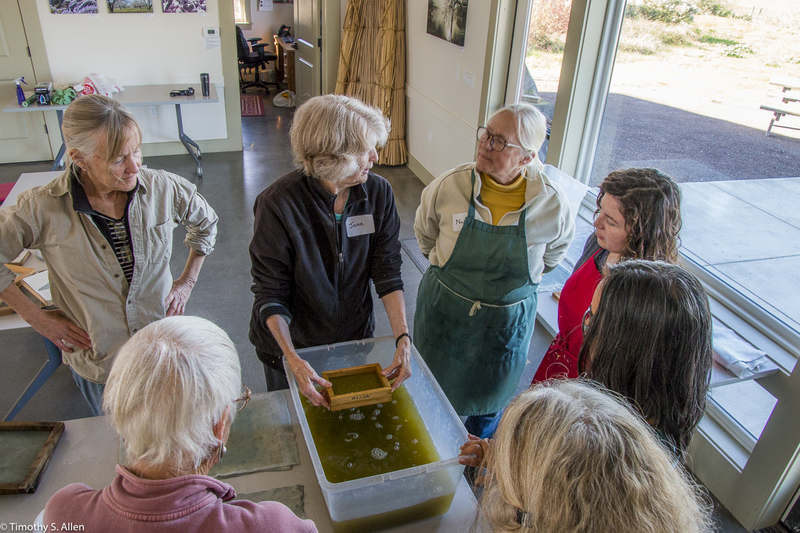 Learn to use dyes and pigments to color pulp as well as natural dyes and the natural color of different plant fiber pulps. 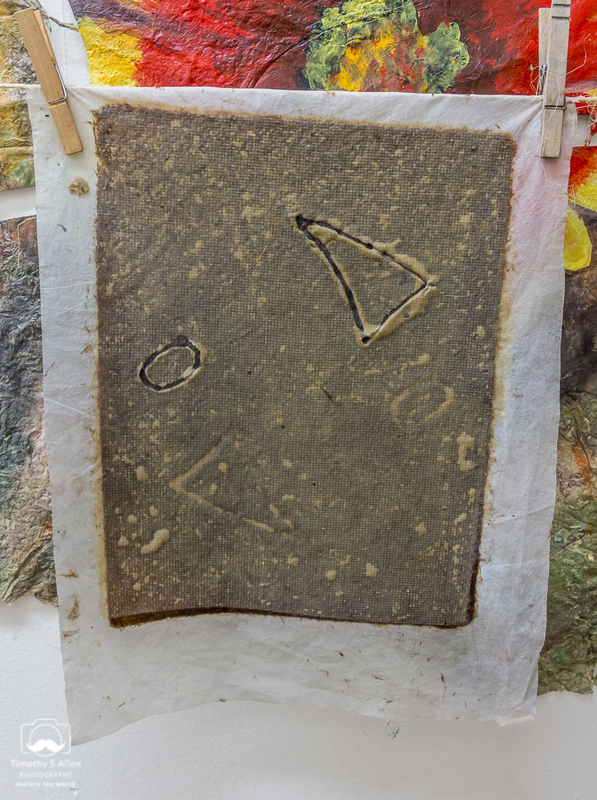 Your handmade paper can be used for painting or drawing with watercolors, inks, dry media, acrylics, oil, encaustic and other techniques, as well as creating the art with the colored pulp. 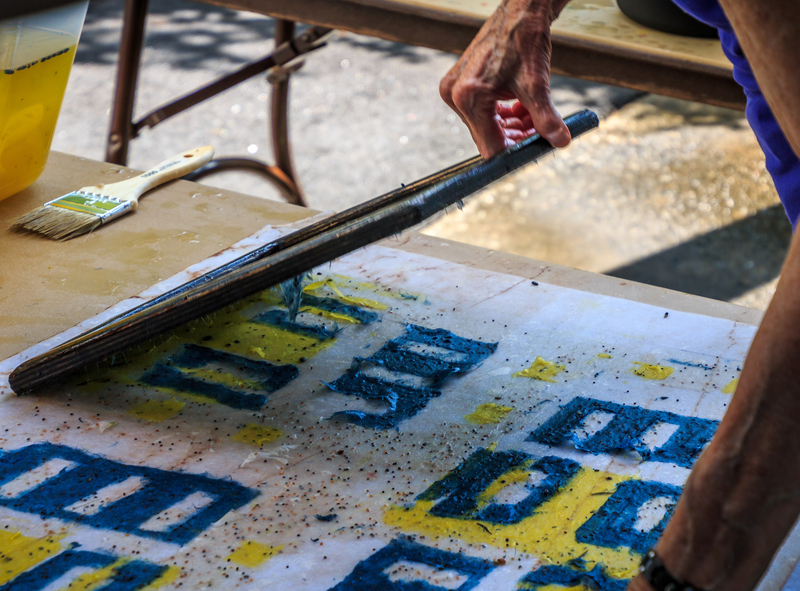 We will create paper sheets up to 11” x 17” using a variety of fibers that have unique textures and colors. 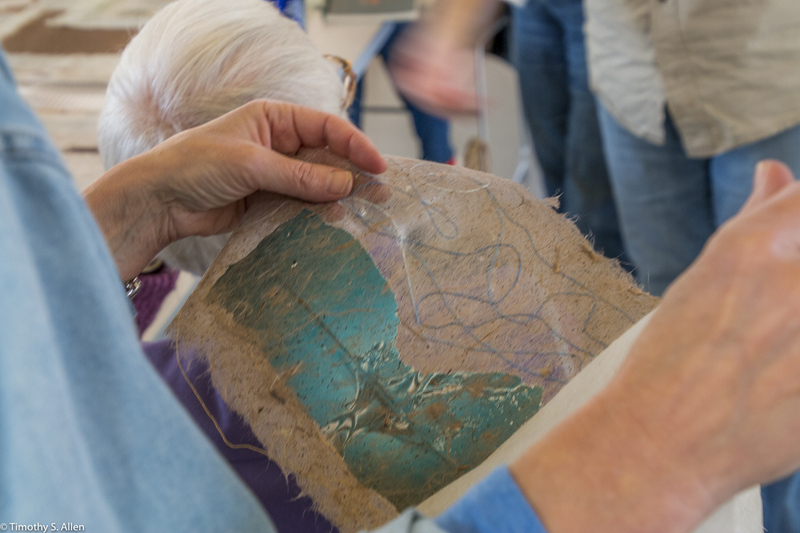 We will learn pulp painting and other techniques for creating imagery with paper pulp as well as applying mixed media painting techniques on the handmade paper. 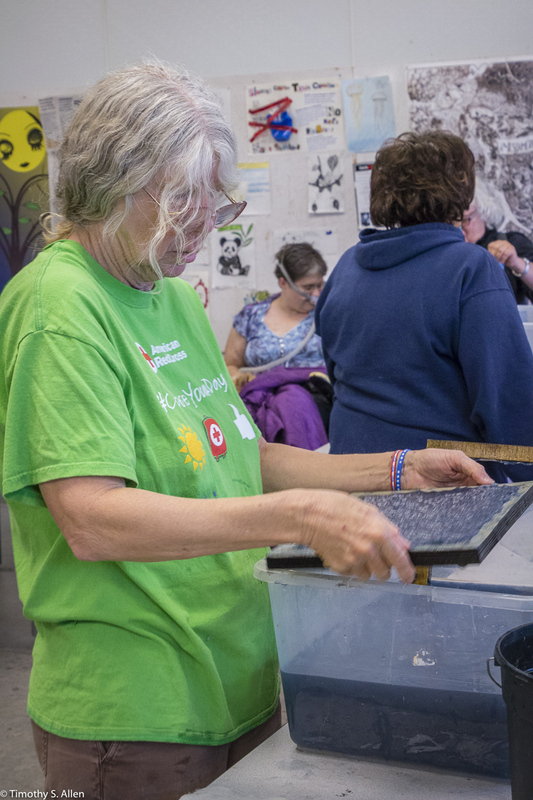 Saturday, April 27, 10AM to 4PM. 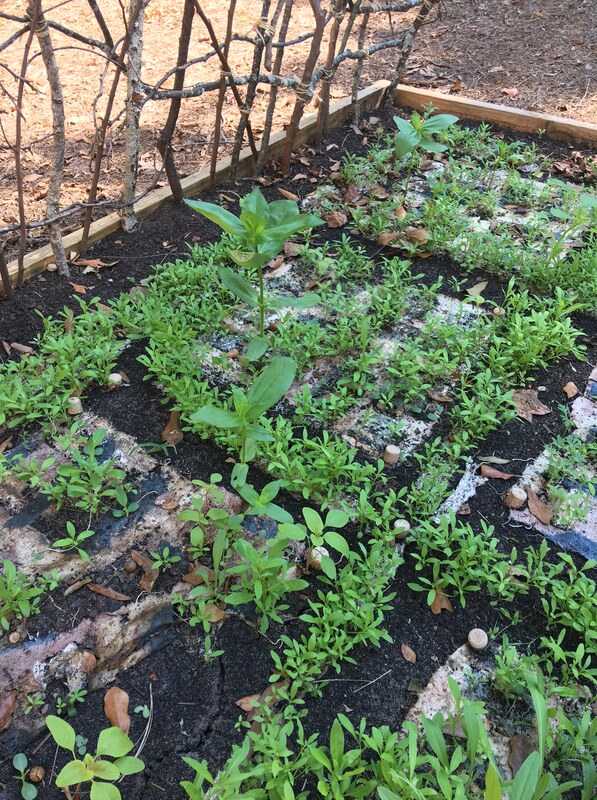 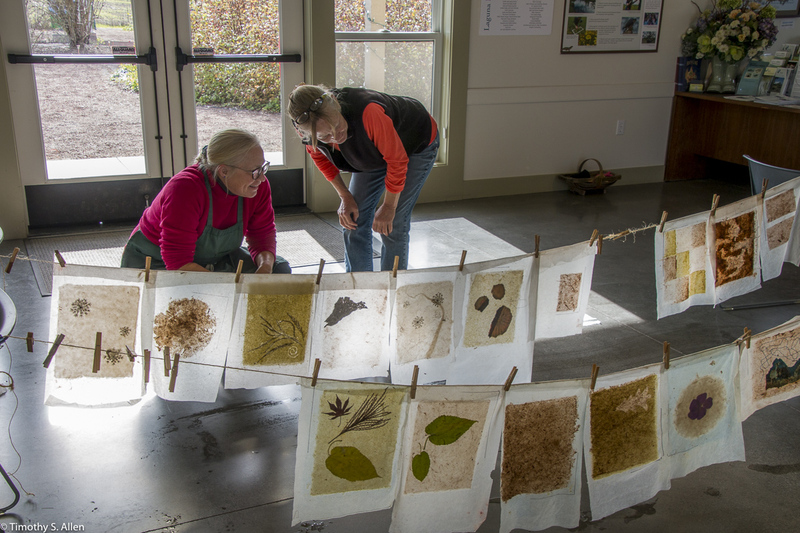 Plants to Paper: Learn how to make handmade paper from local plant waste materials such as leaves and bark of common local plants. 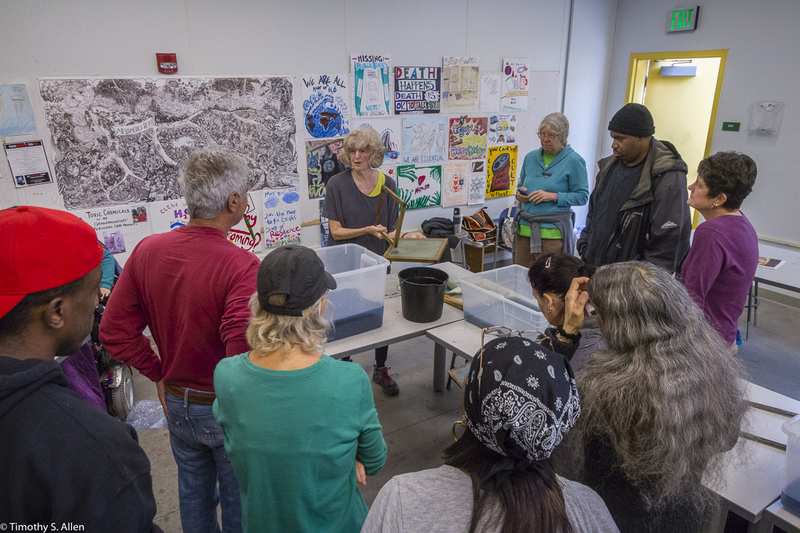 This class will cover how to make paper from “scratch” using materials found locally and easily available equipment and supplies and sustainable methods. 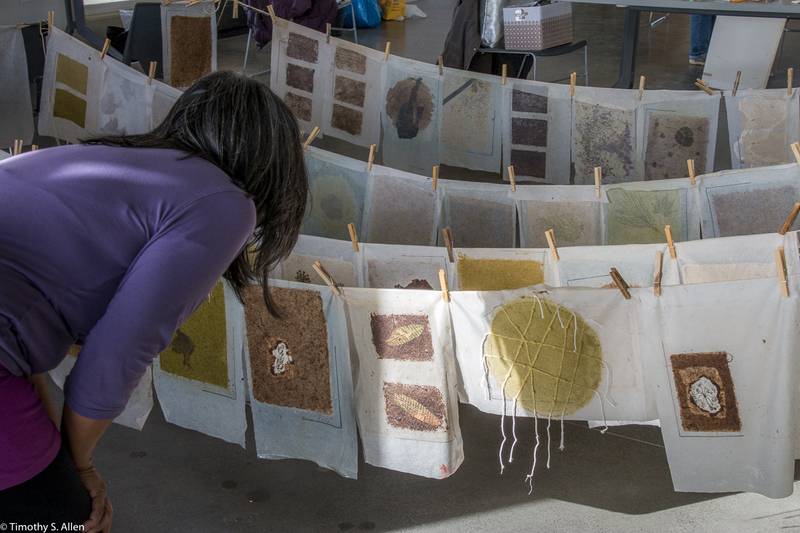 We will identify, gather, cook, beat and form handmade paper from a variety of local plants to create unique place-connected handmade papers with a variety of natural colors and textures. 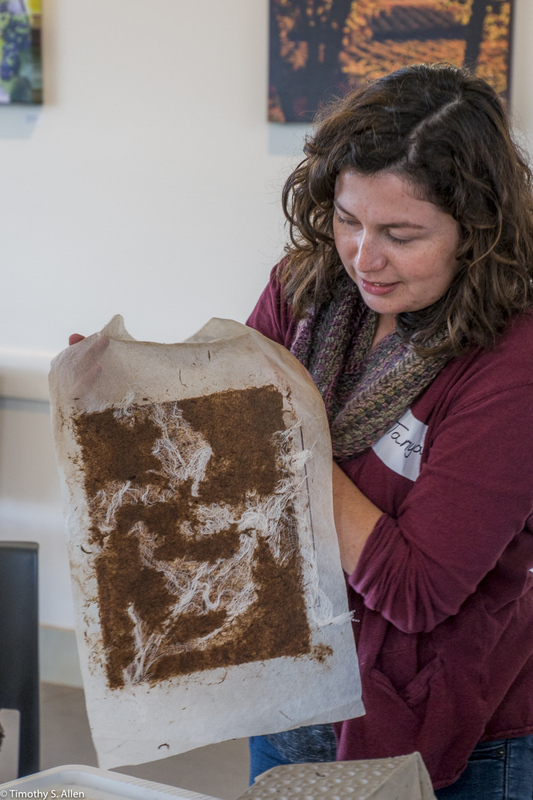 We will create sample books and compile records and recipes for making paper from local plants. 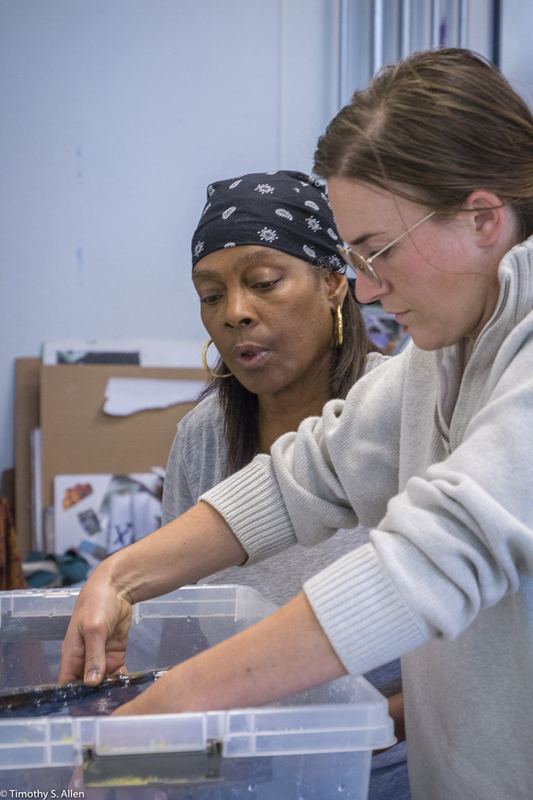 Getting Grants and Residencies: Learn to find and make wining applications for a grant or residency. 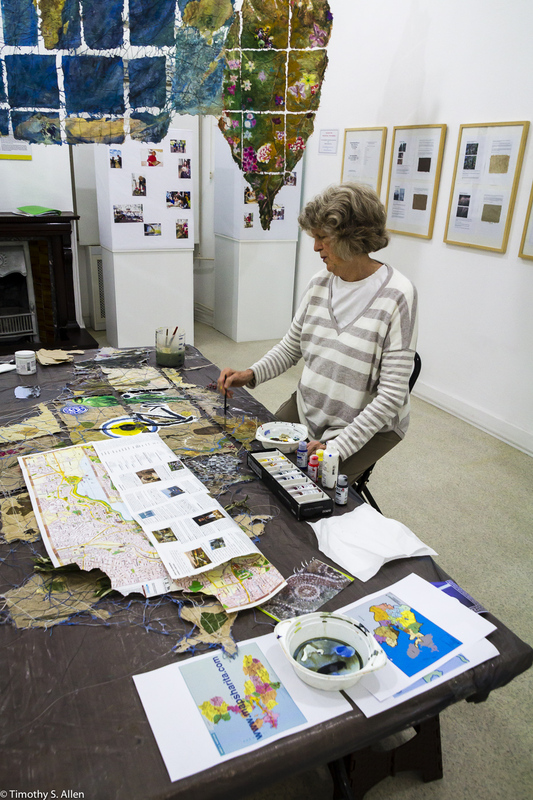 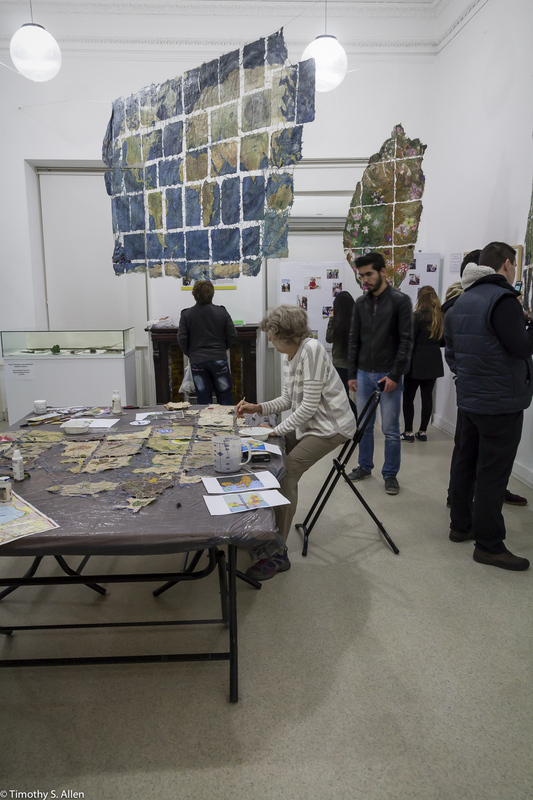 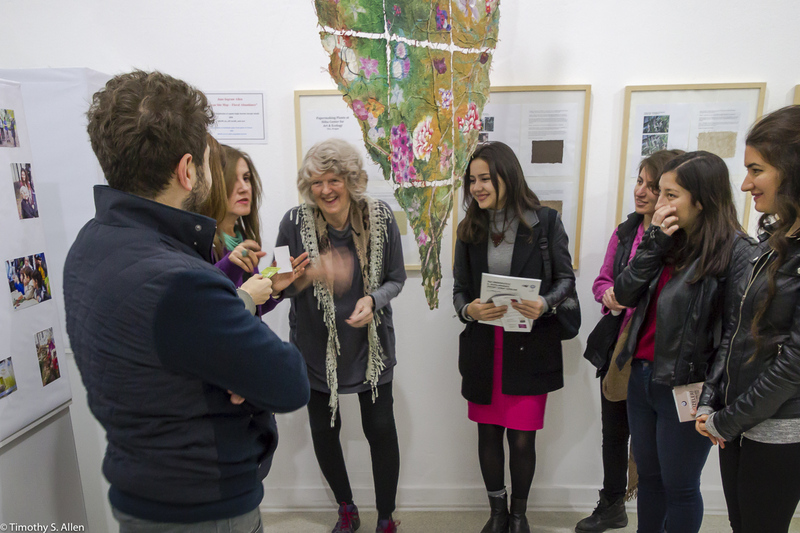 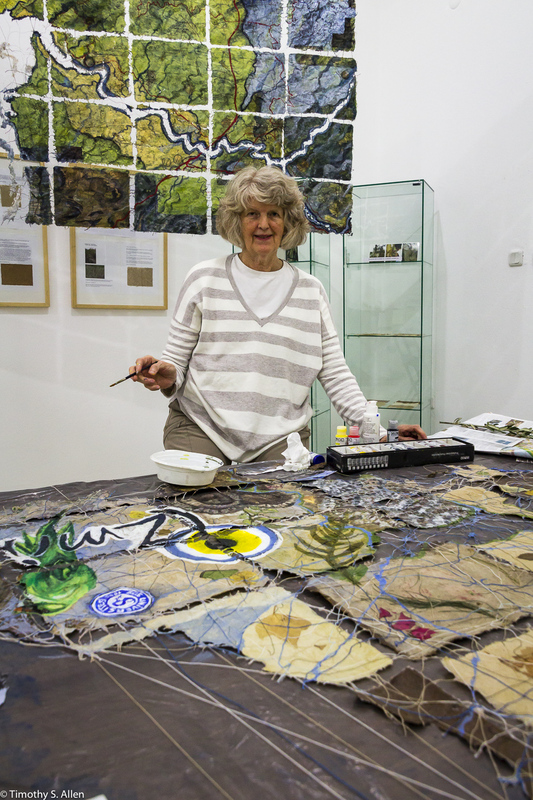 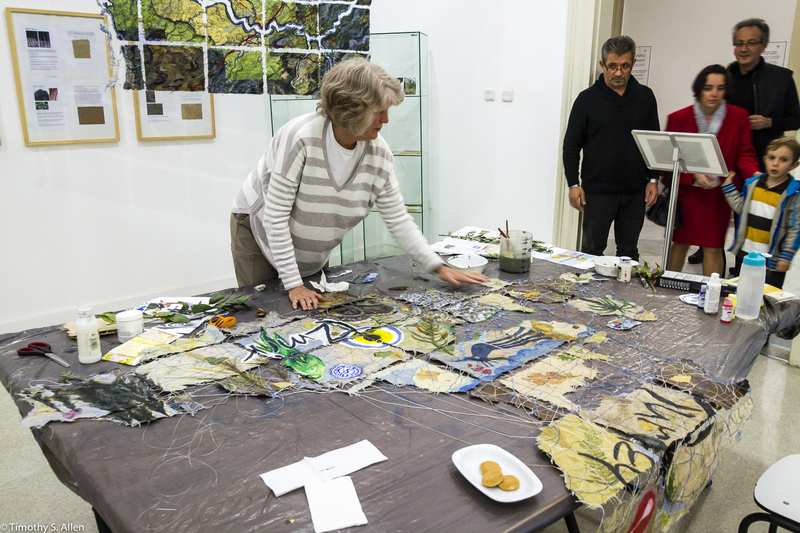 In this open session for all artists, with individual coaching and Q & A, Jane will share her experiences getting grants for residencies, public art projects and research and art making opportunities internationally. 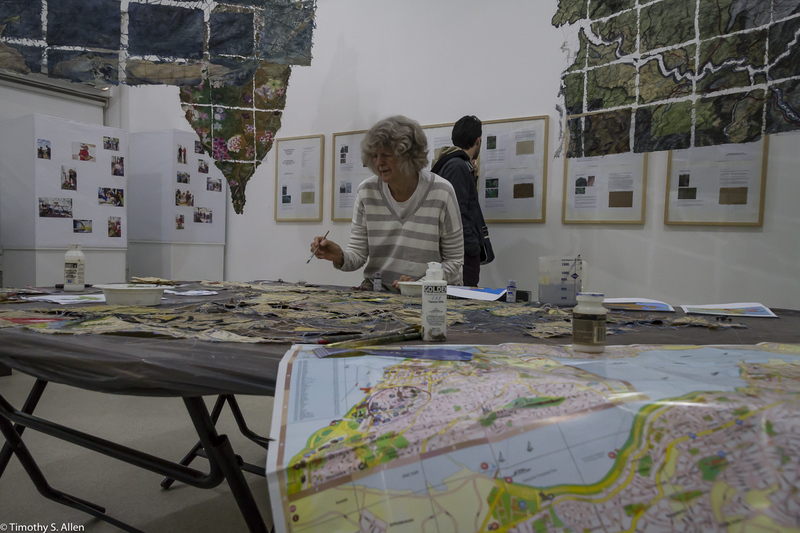 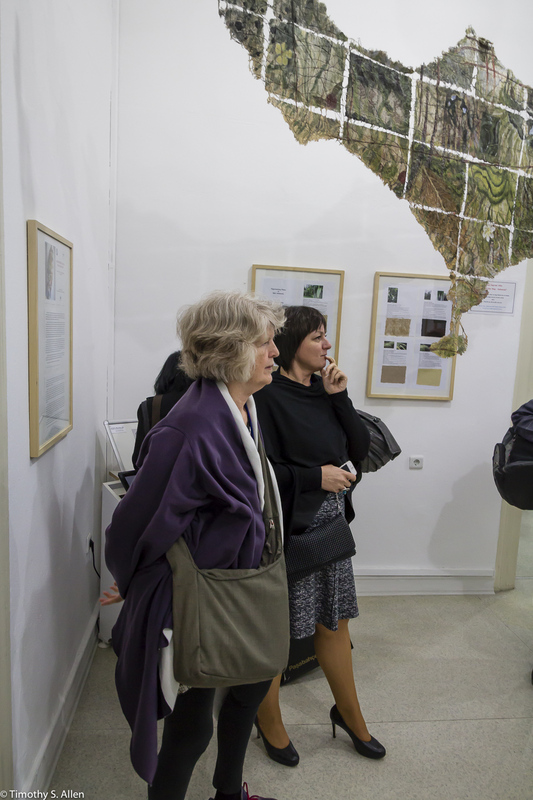 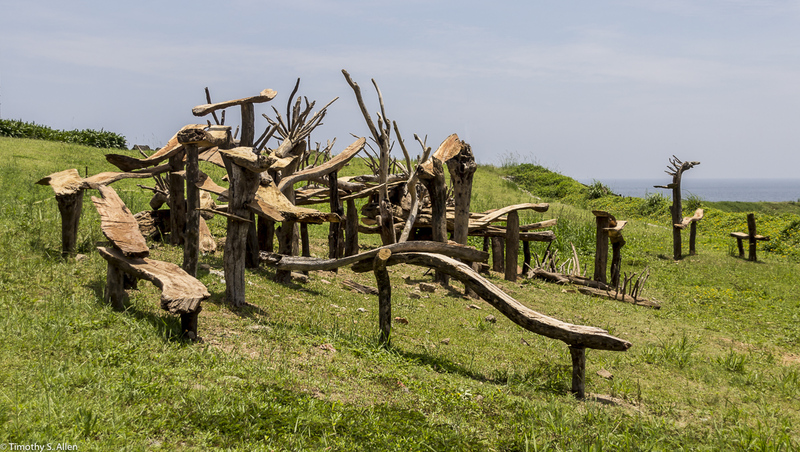 Jane has received grants from state, local and national foundations, arts councils, museums and public art commissions as well as three Fulbright Awards and grants to do artist-in-residencies in Japan, Nepal, Indonesia, Tanzania, China, Taiwan, Turkey and other countries as well as in the USA. 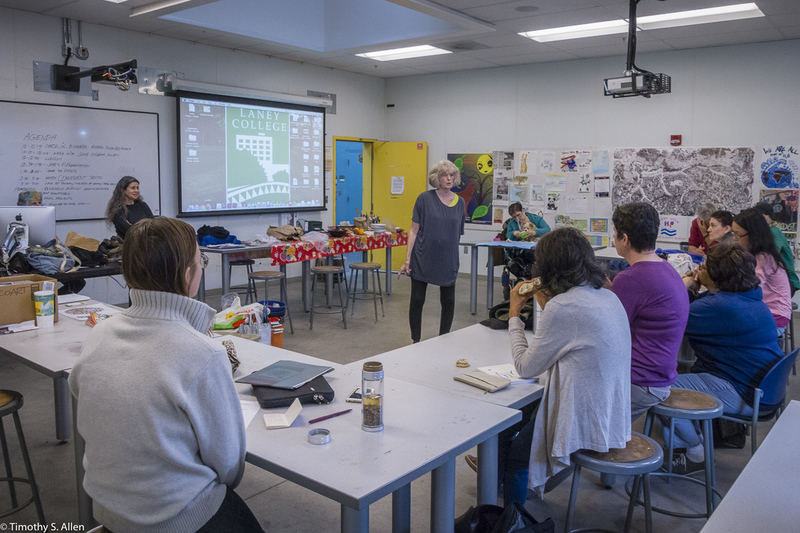 Participants in this workshop, should bring examples/images of their artwork, a resume and artist statement and printed out information about any opportunities you are thinking about applying for. 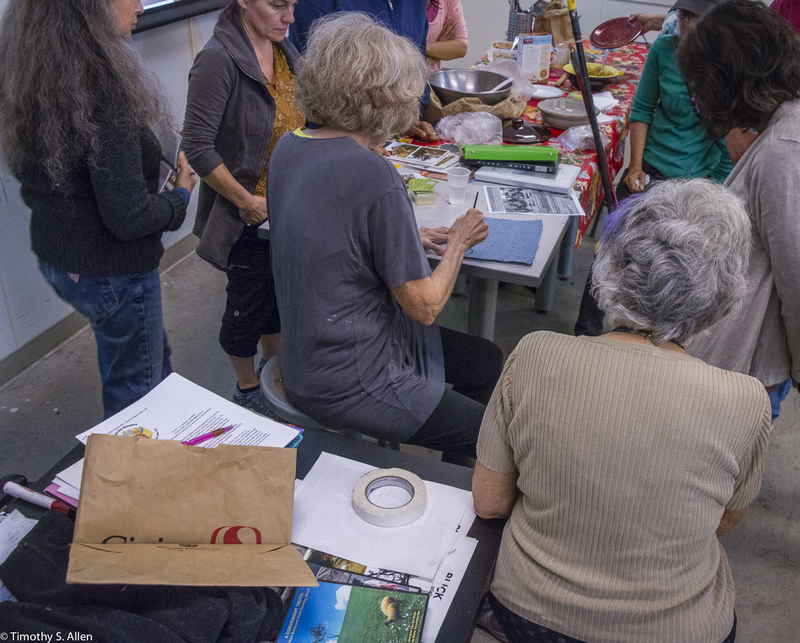 Bringing your own laptop would also be good for this workshop. 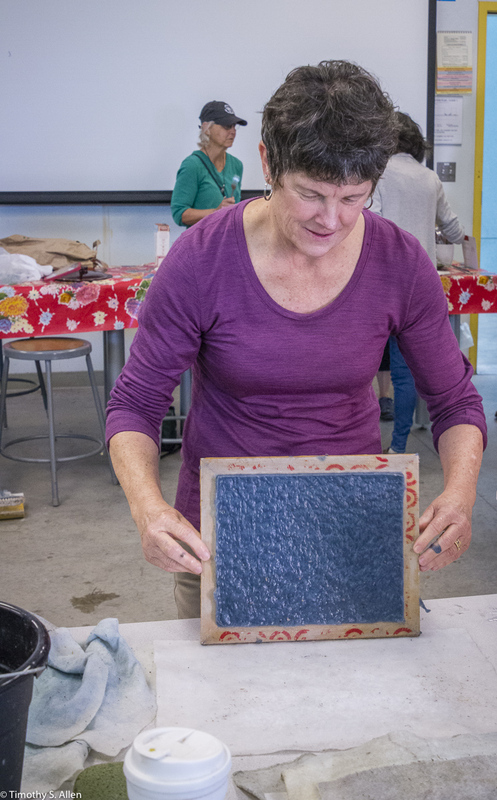 Sculptural Papermaking: Learn to make handmade paper sculptures and installation art using a variety of plant fibers and combining hand papermaking with various sculpture techniques, such as casting, embossing, molding, constructing, building over armatures and modeling. 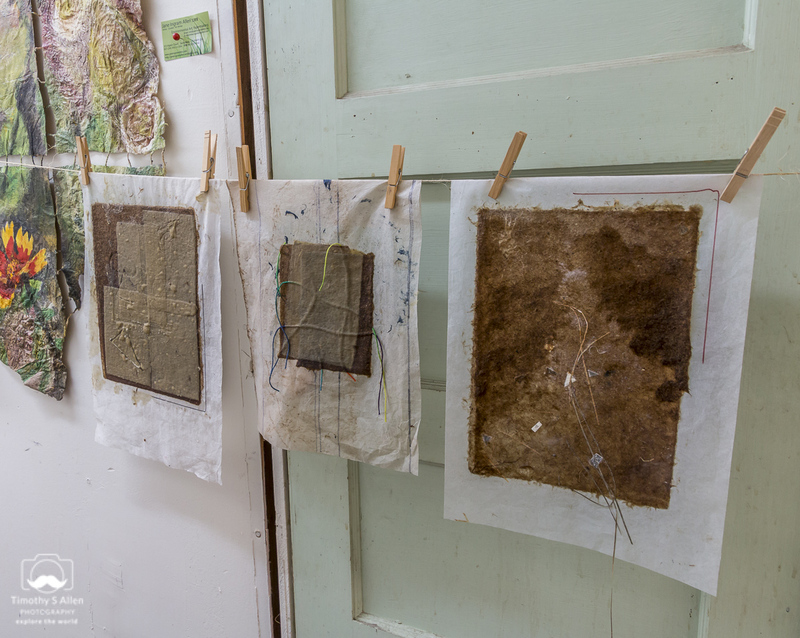 We will create handmade paper sculptures and mixed media works using pulps made from abaca, kozo (mulberry bark), cotton, and other locally collected fiber plants. 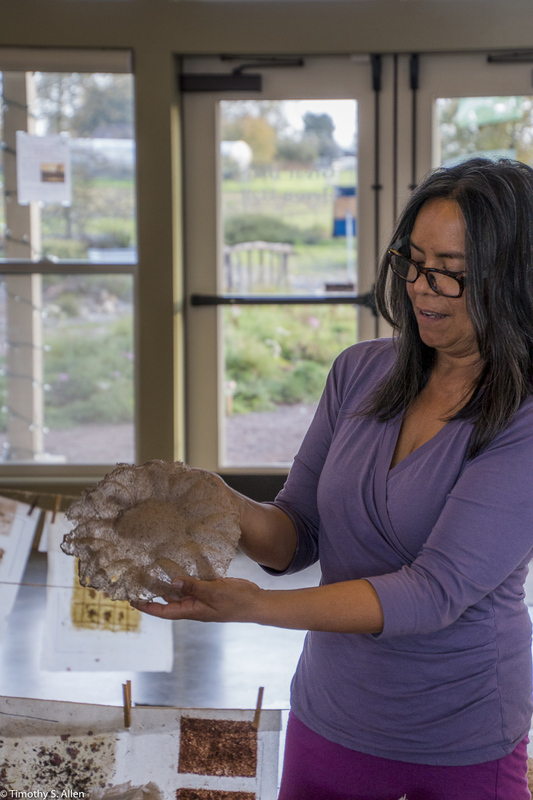 Using three-dimensional techniques and natural colors and textures from the various plant fibers, expand your horizons and discover new possibilities in sculpture. 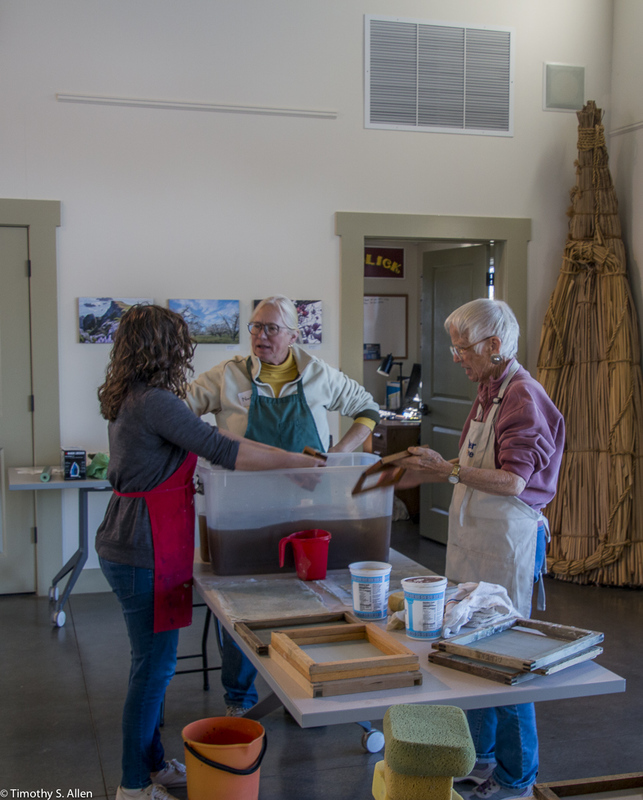 • Saturday and Sunday, May 18 and 19, 10AM to 4PM. 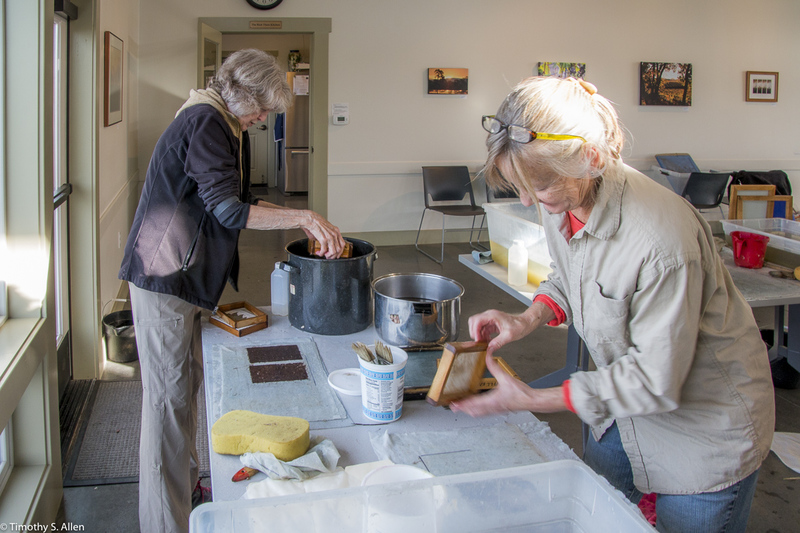 Papermaking Studio Rental: Jane’s Papermaking Studio is available for your personal use (weekdays or weekends) at a fee of $15/hour (minimum of 4 hours). 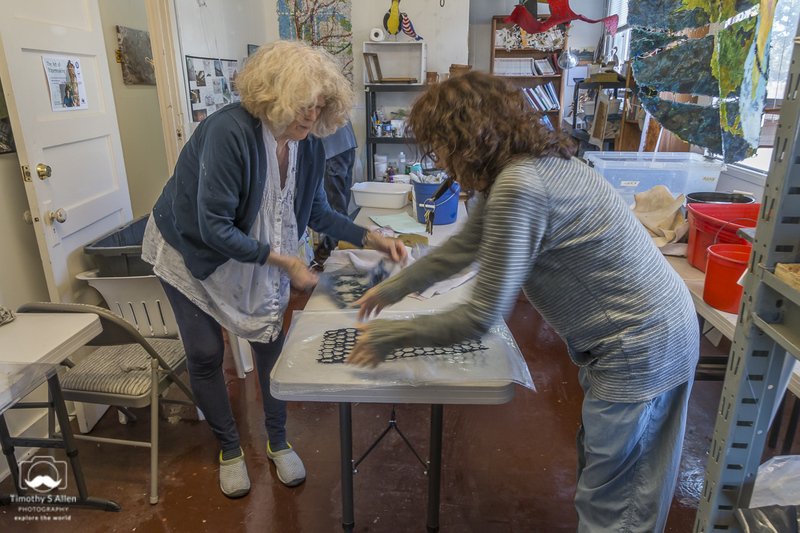 To rent the studio you are required to take at least one workshop with Jane and attend a special session by phone or email about using the studio and materials. 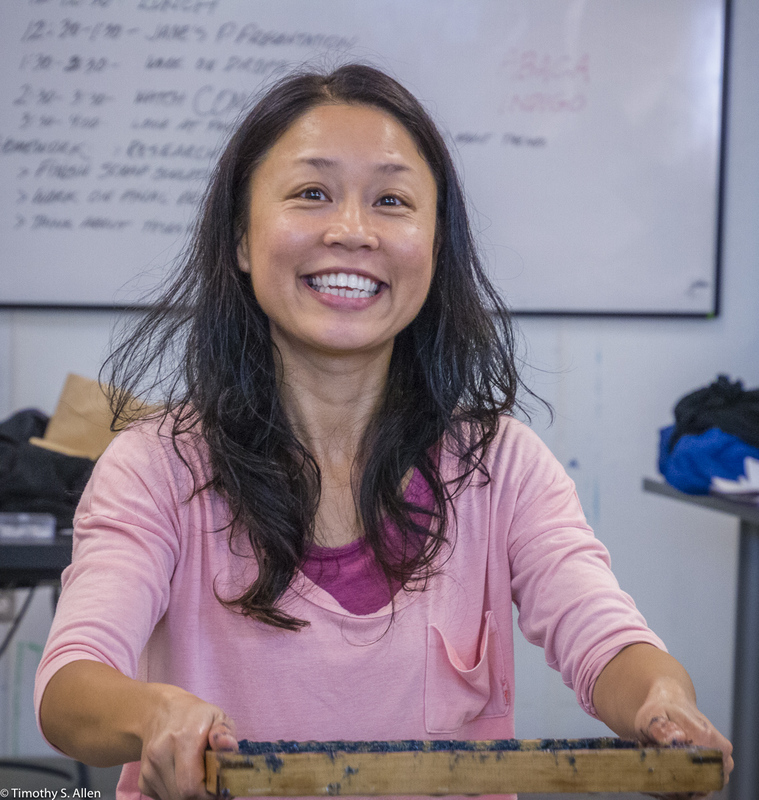 Jane will prepare materials and be there for consulting. 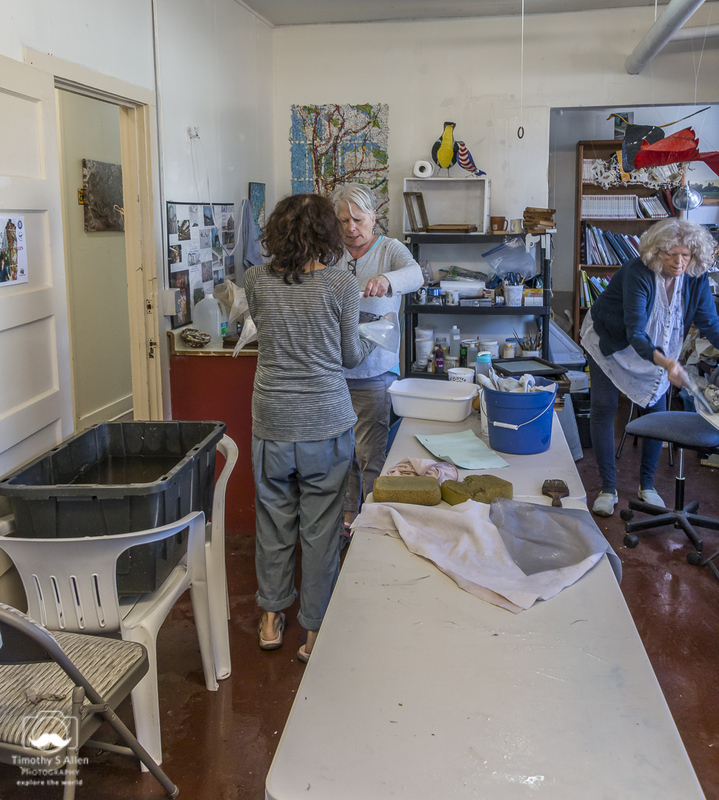 You will have use of the studio space and Jane’s equipment. 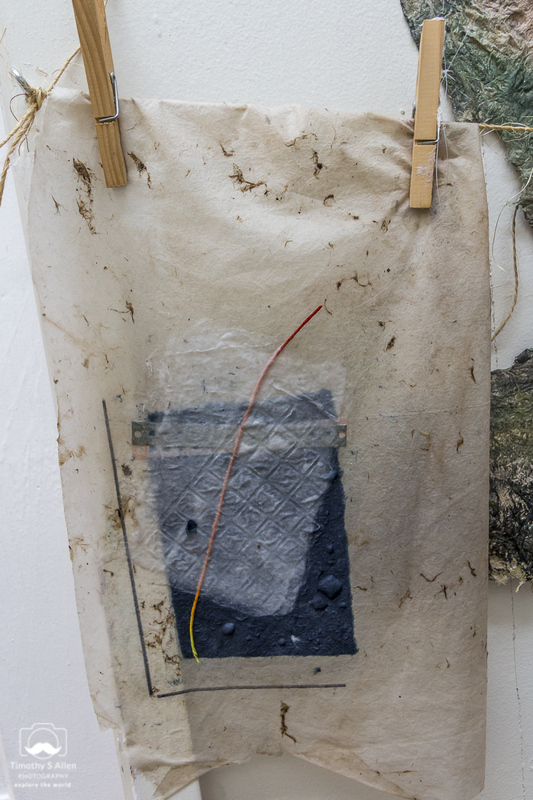 Materials cost will depend on what pulp and other materials from Jane are used and will be discussed at the studio session. 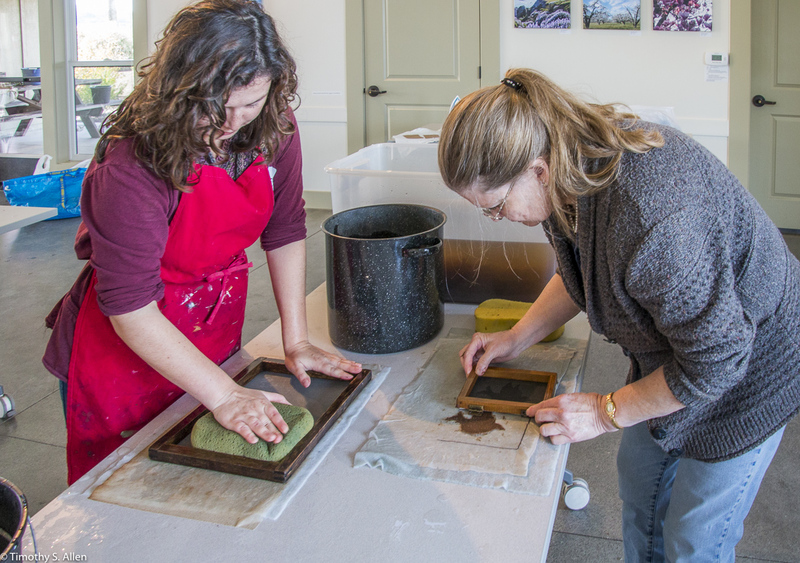 To Register for a class: contact Jane at info@janeingramallen.com or phone 857-234-2432. 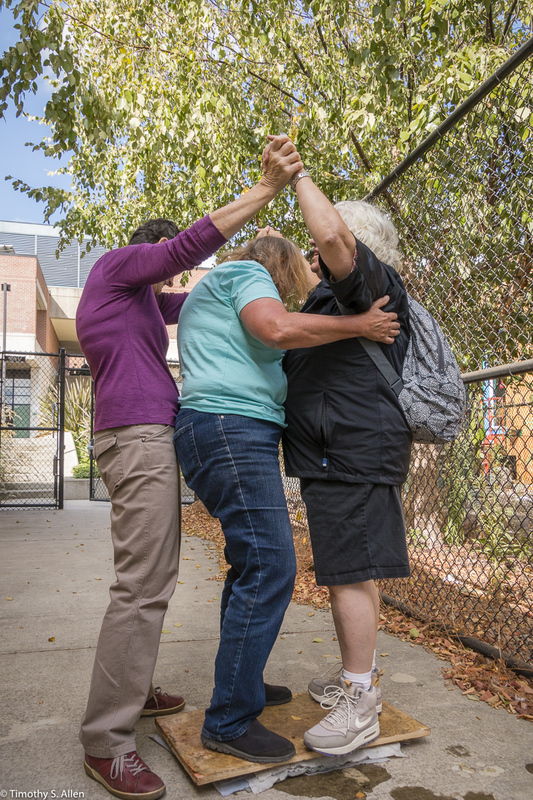 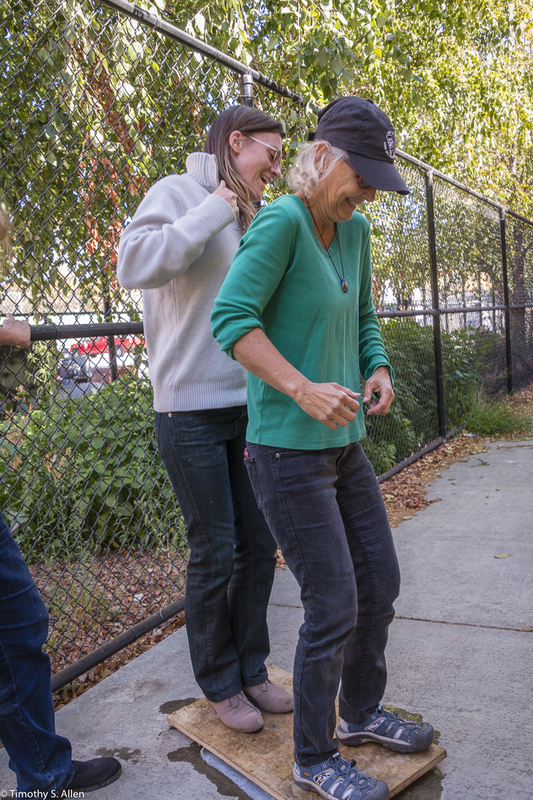 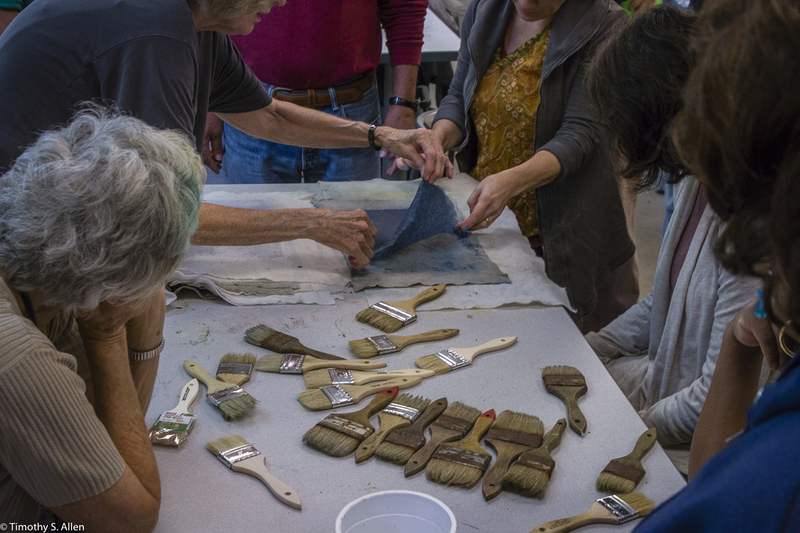 Look for more classes to be announced here in Summer and Fall. 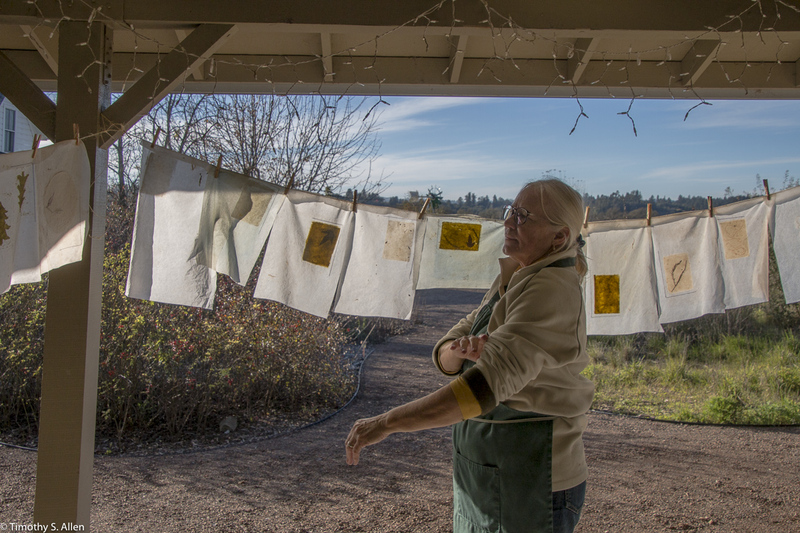 I am happy to offer papermaking workshops now in my Santa Rosa, CA, studio. 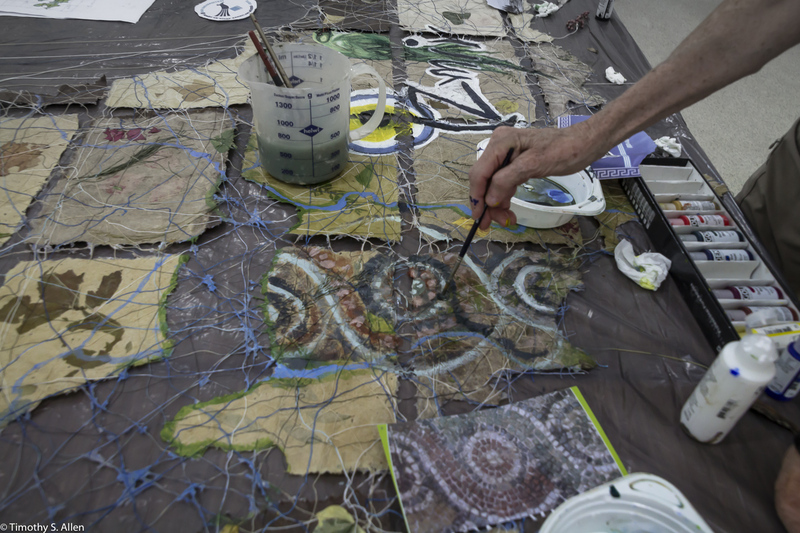 Please contact me for more information (info@janeingramallen.com) or to register for a workshop in February. 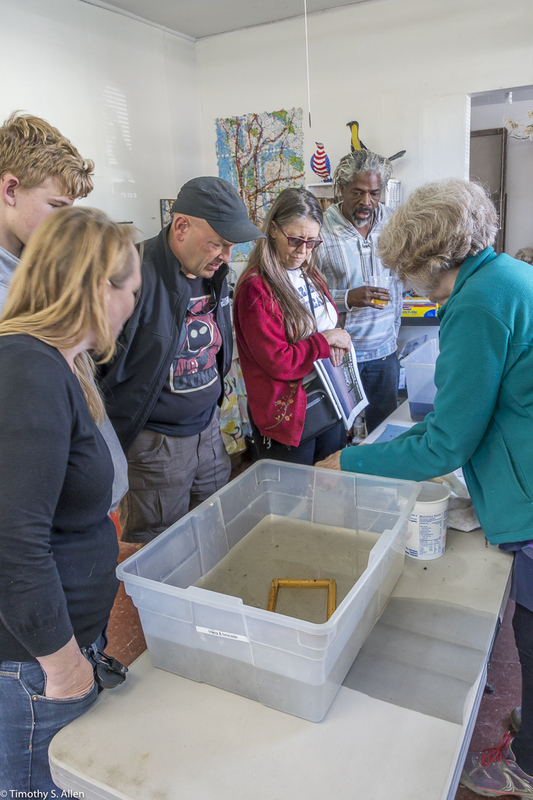 Other workshops will be planned, so also let me know what you would like to learn and what days or times are best for you. 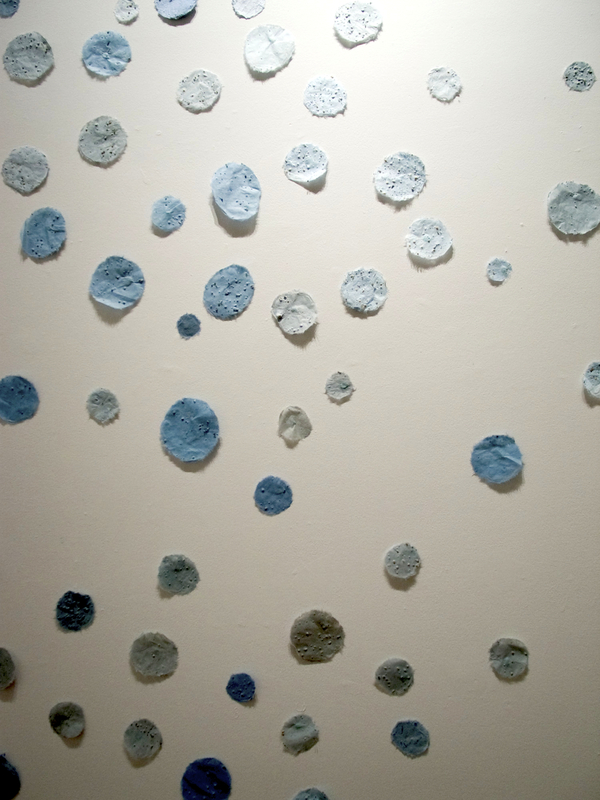 • Create your own unique paper. 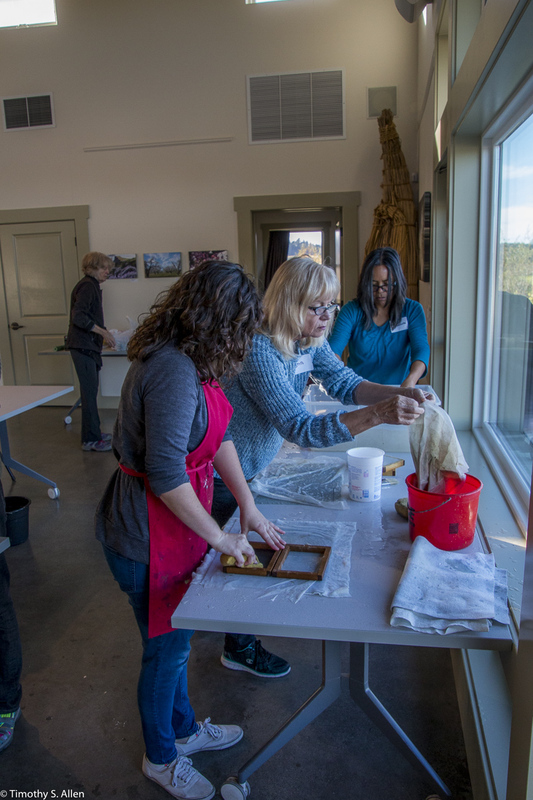 • Experience the zen of hand papermaking. 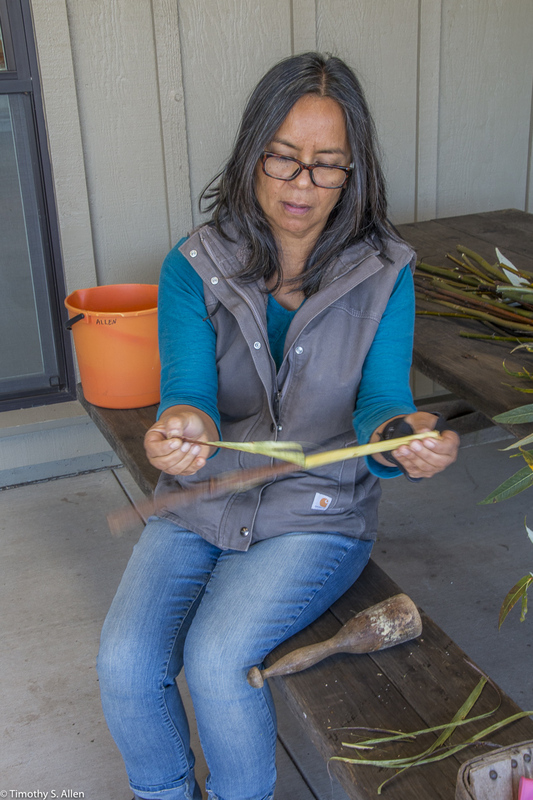 • Learn about the unique qualities of different plant fibers. 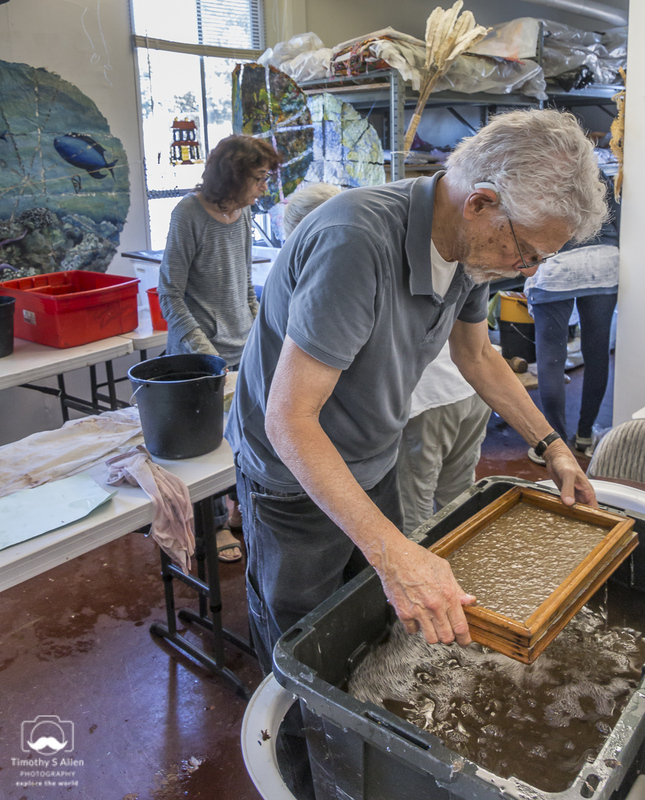 • Make the handmade paper itself the finished work, or combine it with printmaking, painting, drawing, bookmaking, collage, sculpture, basketry, weaving, etc. 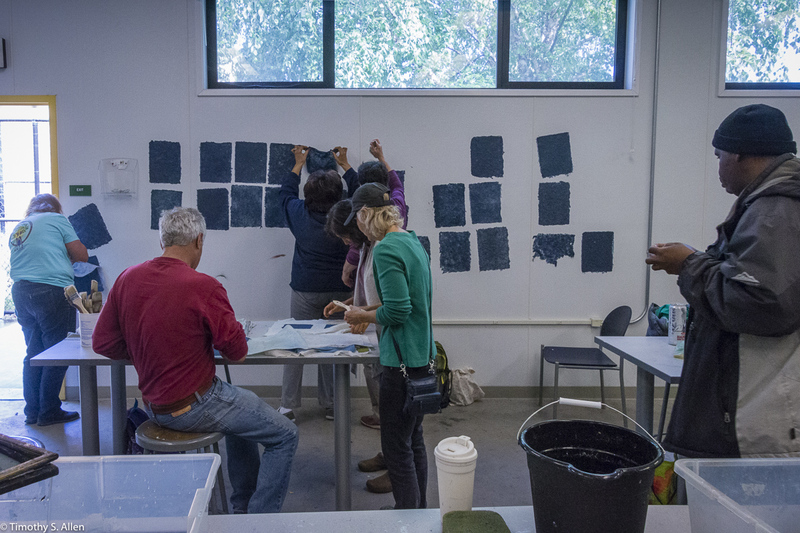 • intimate setting; class size limited to 5 people. 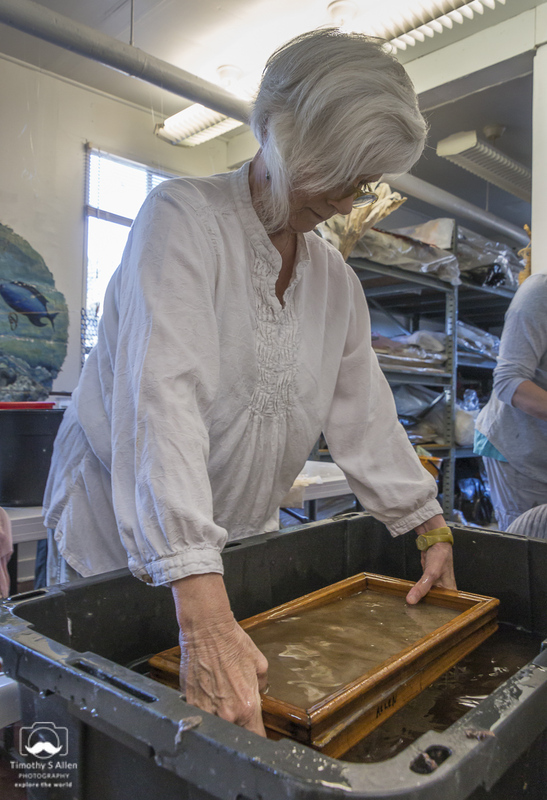 • Beginners and experienced papermakers welcome. 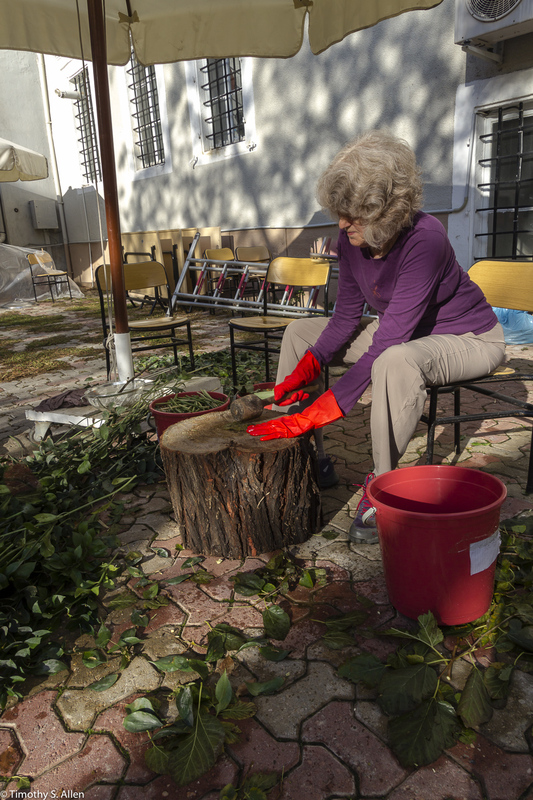 • Equipment and supplies provided. 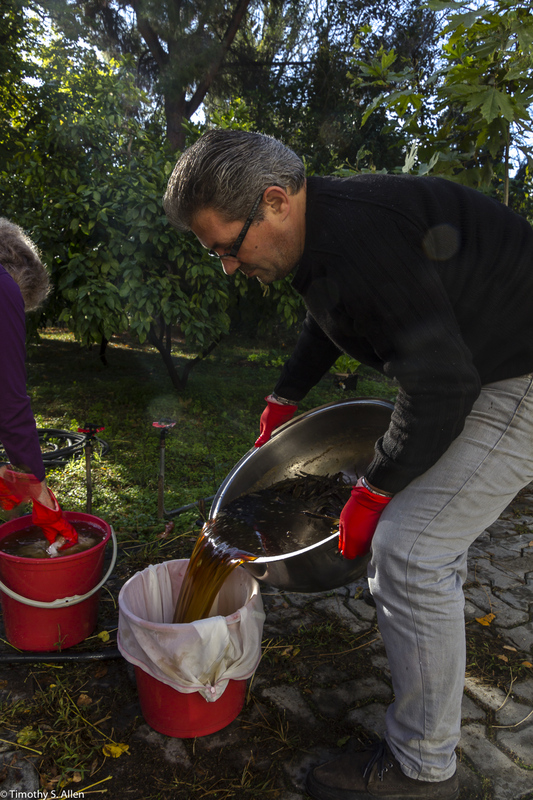 • Coffee and tea provided. 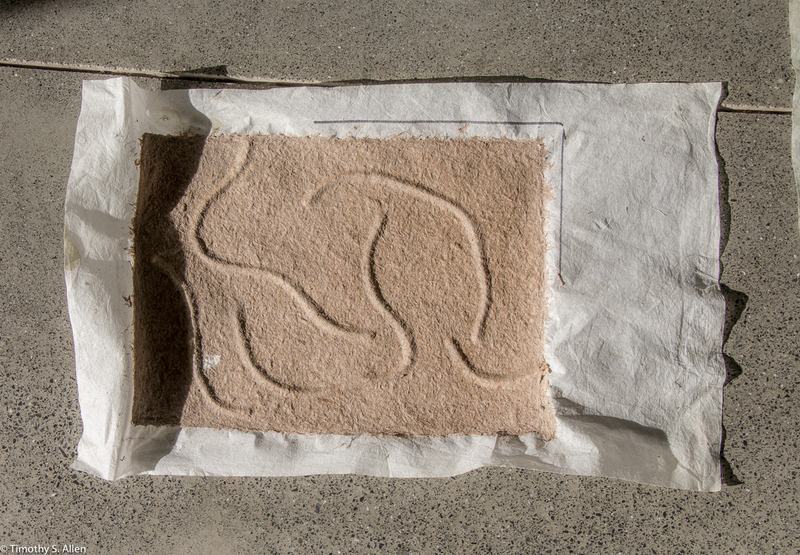 Bring your own lunch. 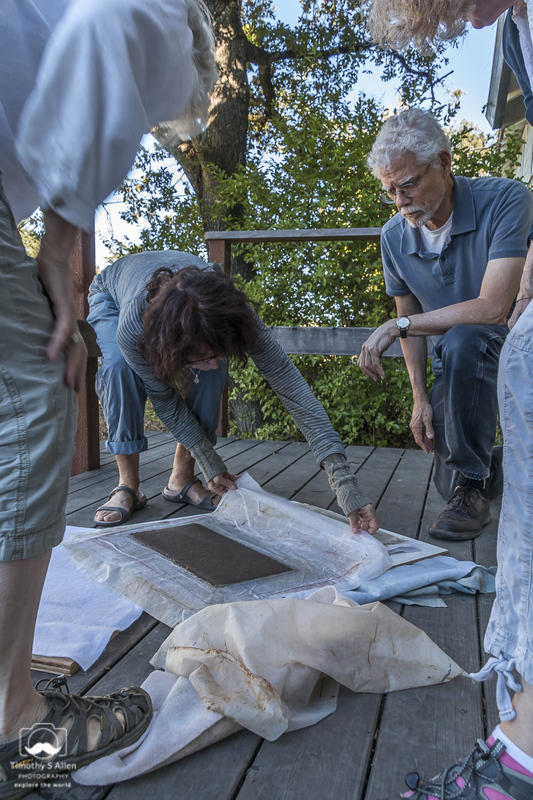 • Papermaking teacher and resident artist in Japan, Nepal, Thailand, Indonesia (Bali), Tanzania, France, England, Brazil, and the US. 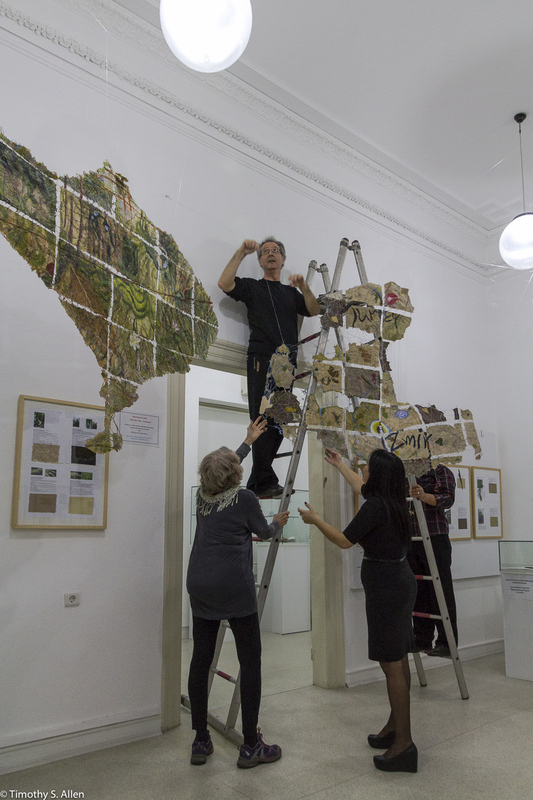 Fulbright Scholar Award artist in Taiwan and Fulbright Specialist artist in Turkey. 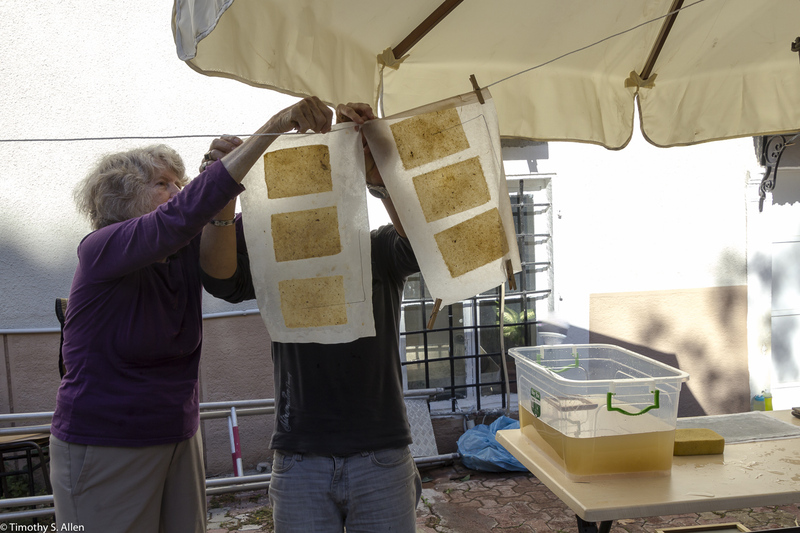 • Trained in traditional Japanese papermaking in Japan, and taught papermaking while living in Taiwan for 8 plus years. 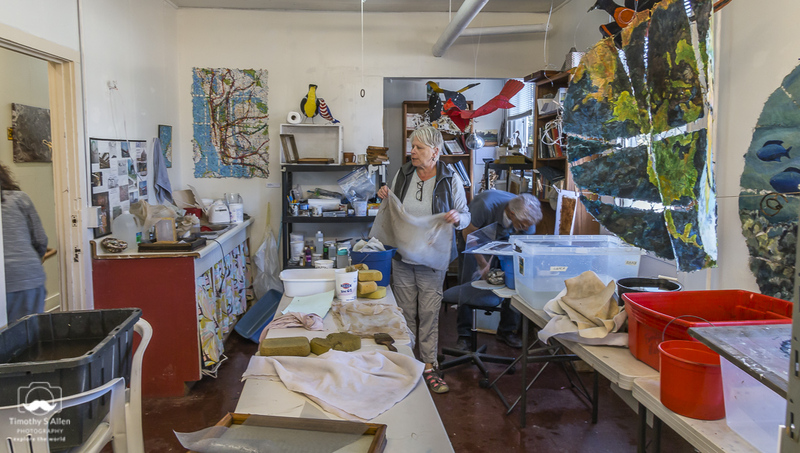 • Former art professor at SUNY, Morrisville, NY, and College of St. Rose, Albany, NY. 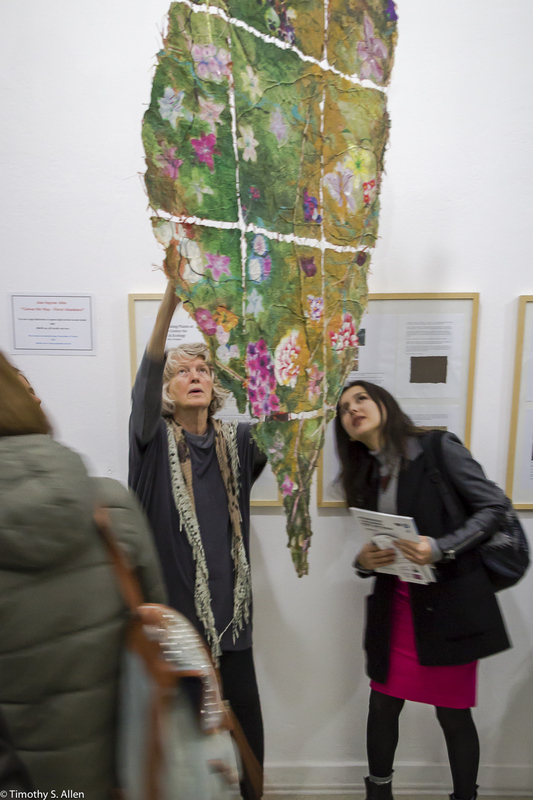 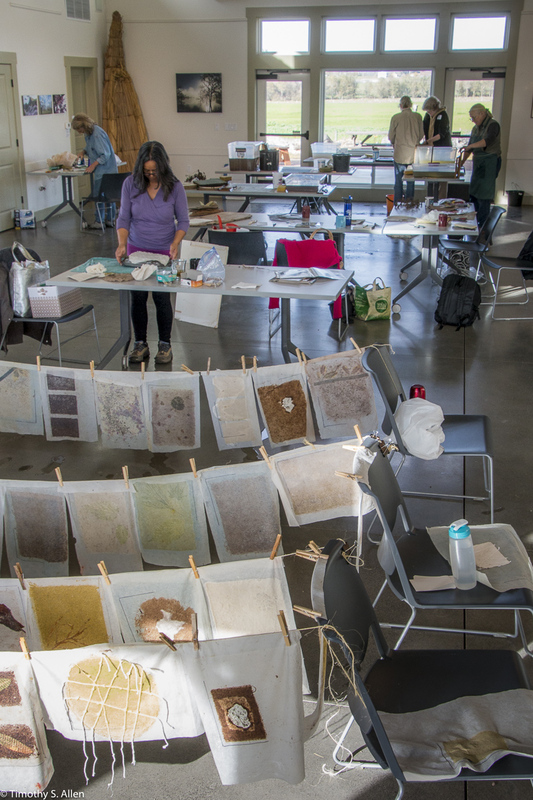 • Taught papermaking workshops in US at Women’s Studio Workshop, Peter’s Valley School of Craft, Morgan Conservatory, Queens Botanical Garden, Sitka Center for Art & Ecology and others. 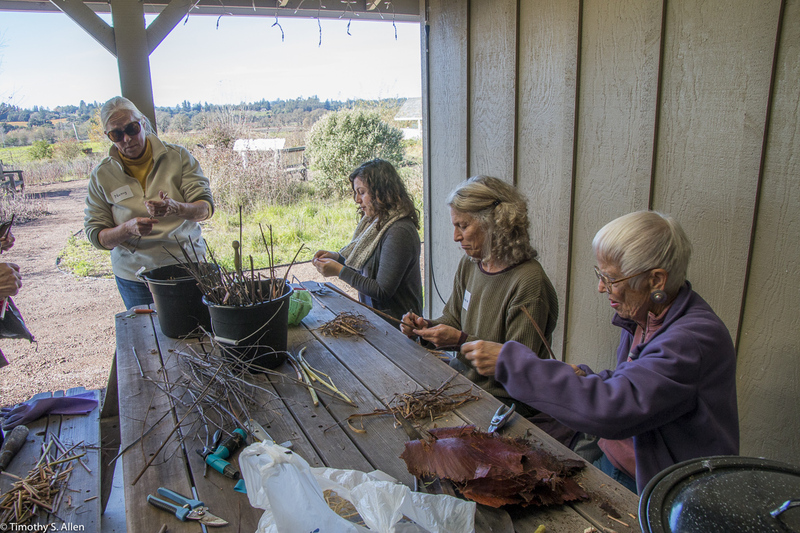 • Saturday, February 10, 10AM to 4PM. 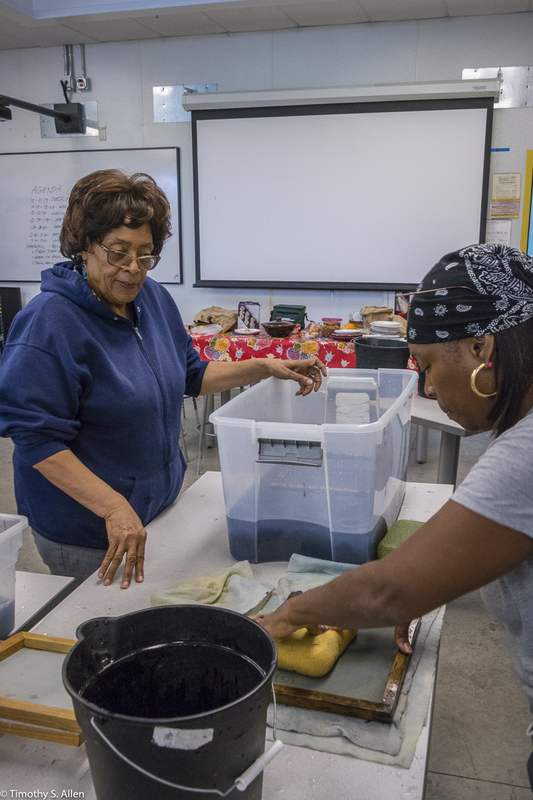 Pre-register by Feb. 2; email to info@janeingramallen.com or phone 857-234-2432. 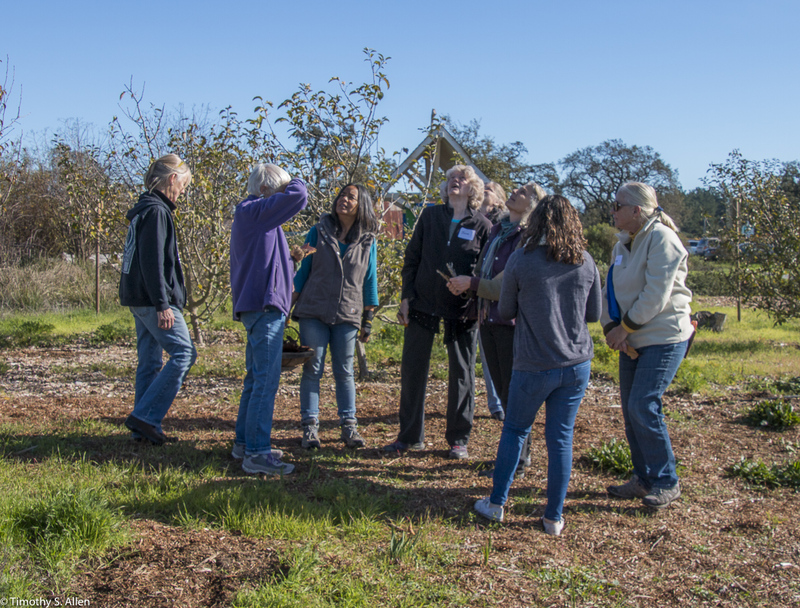 • Saturday, February 24, 2018, 10AM to 4PM. 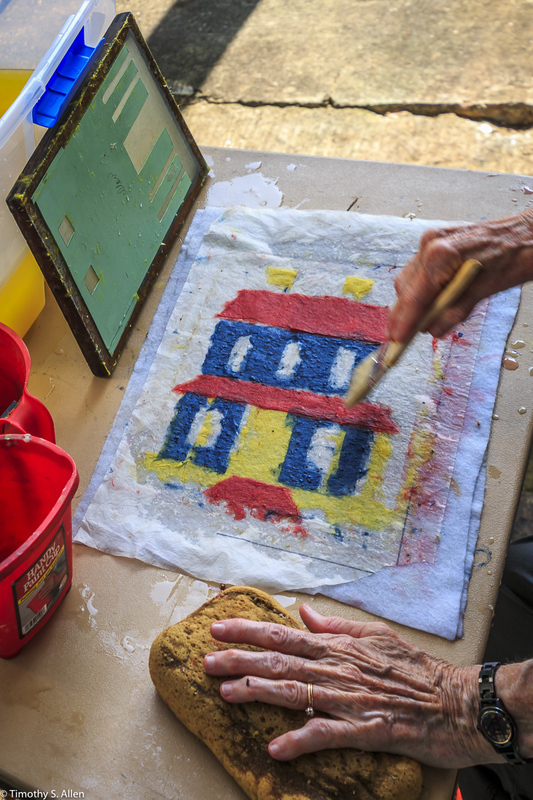 Pre-register by Feb. 16; email to info@janeingramallen.com or phone 857-234-2432. 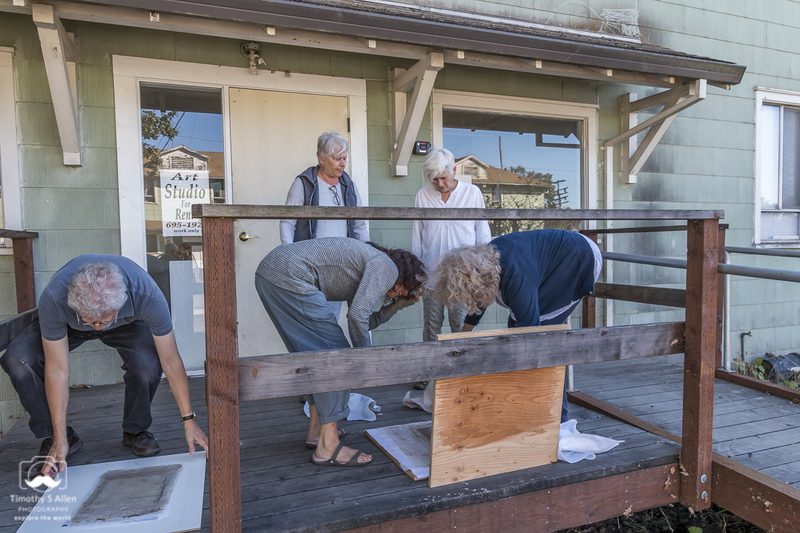 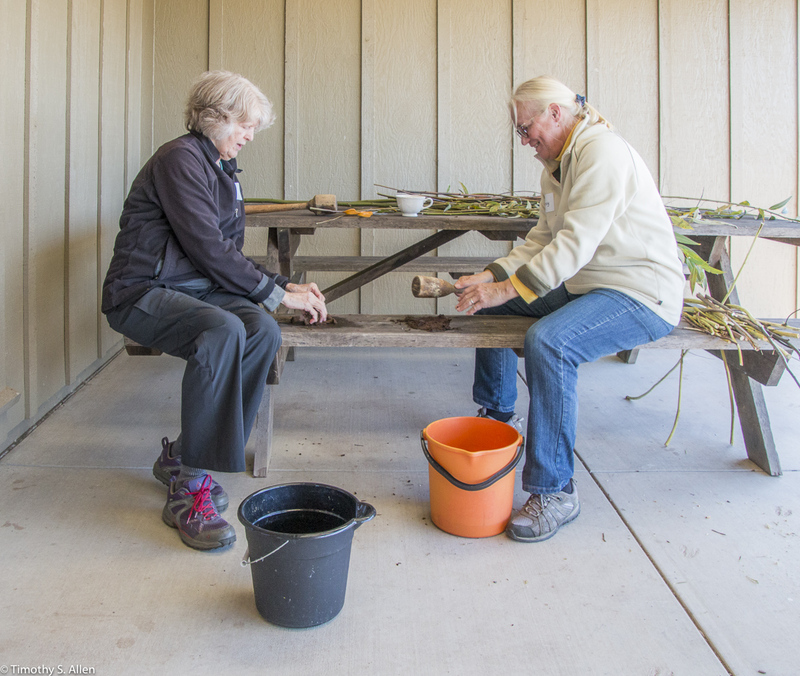 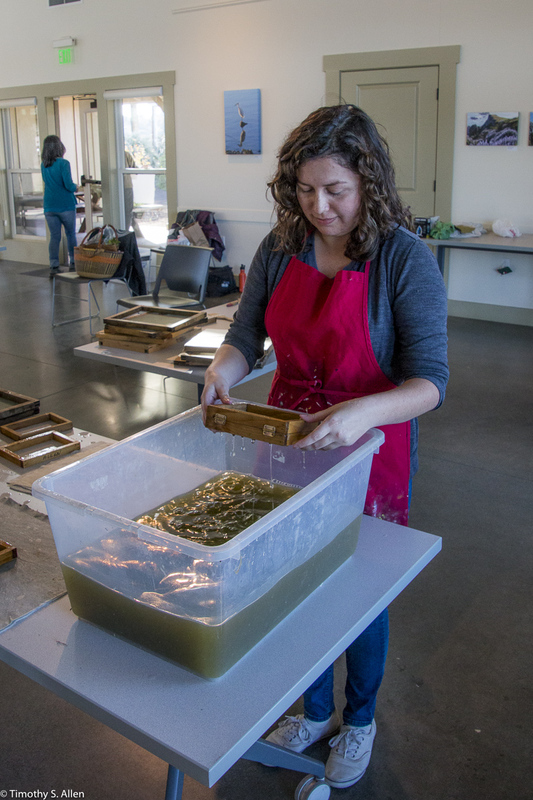 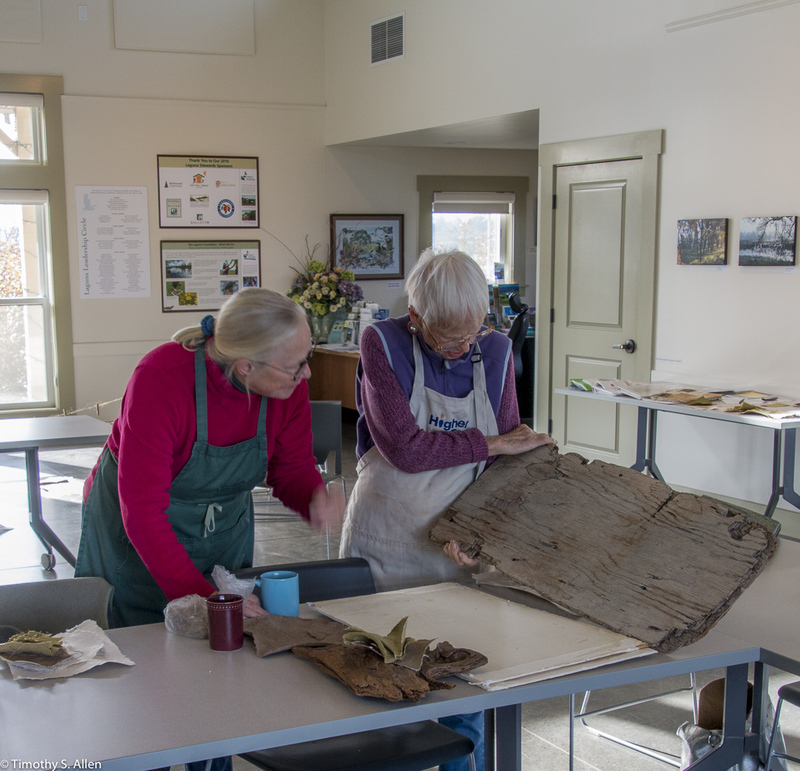 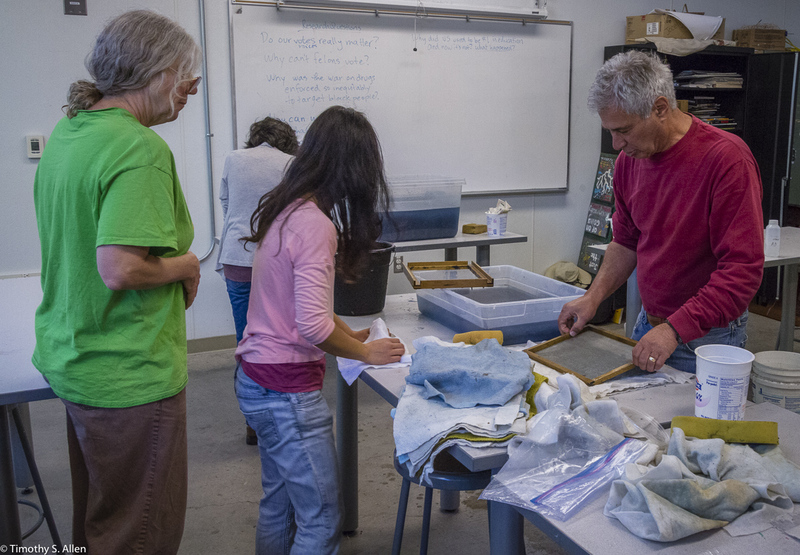 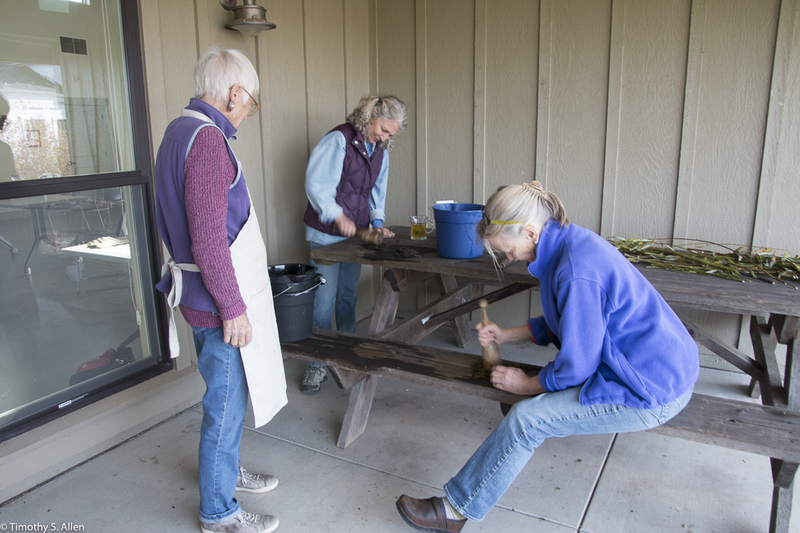 These are photos of the Papermaking with Plants of the Laguna Workshop I taught this past weekend at the Laguna de Santa Rosa Heron Hall in Santa Rosa, CA. 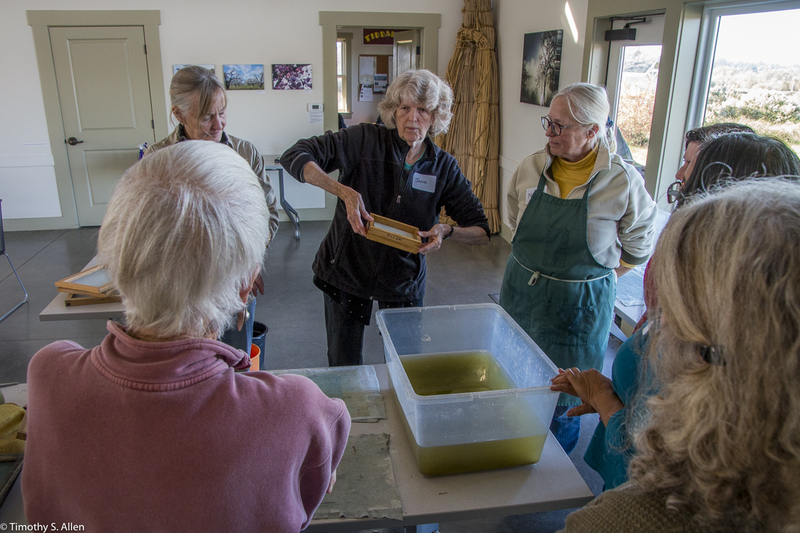 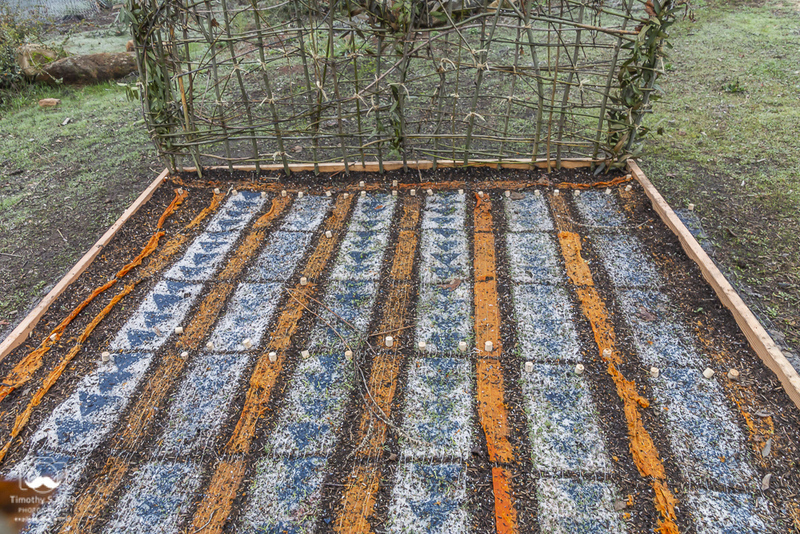 The participants enjoyed two fantastic December days of sunshine and papermaking using local plants. 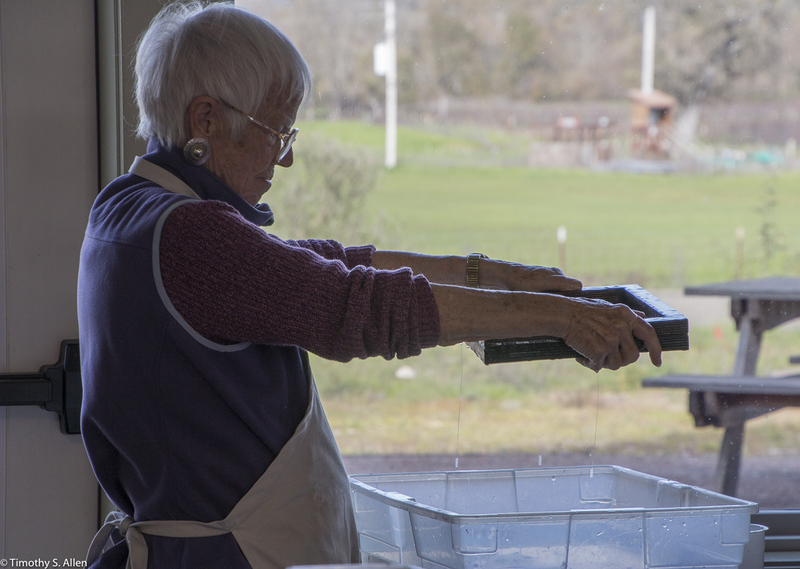 These photos were taken by my husband Timothy S. Allen (http://allentimphotos2.wordpress.com) and show some of the activities during the two days. 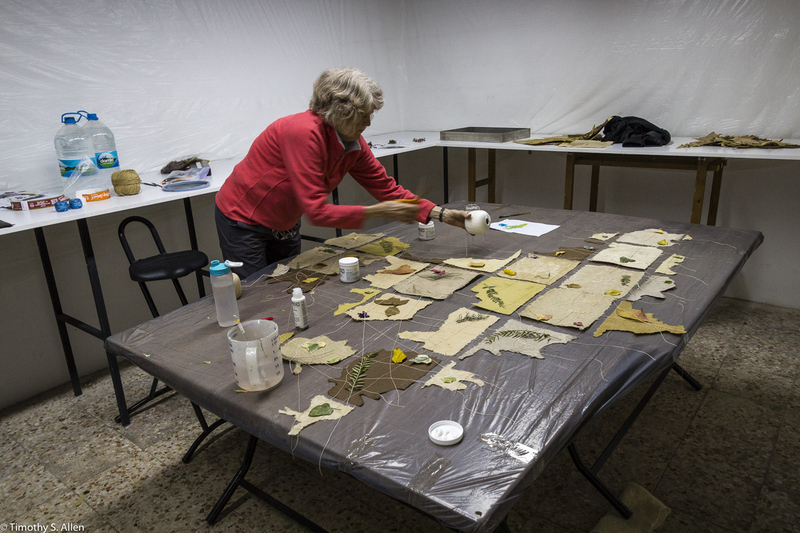 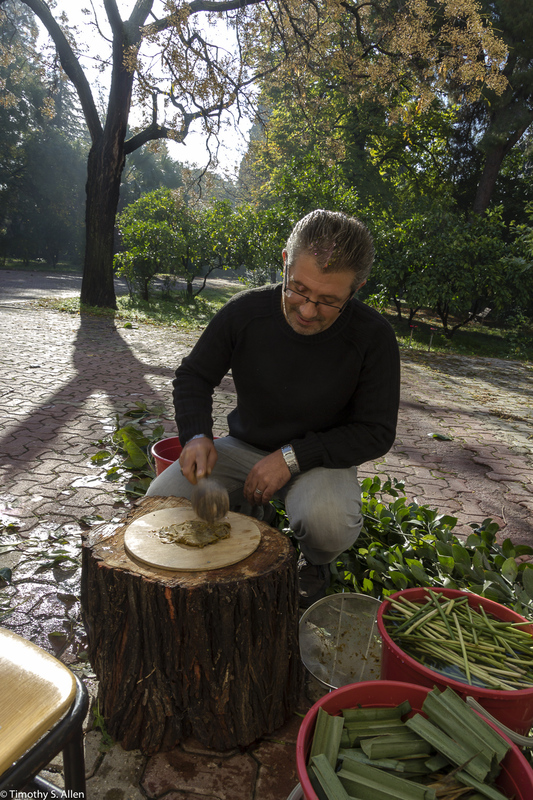 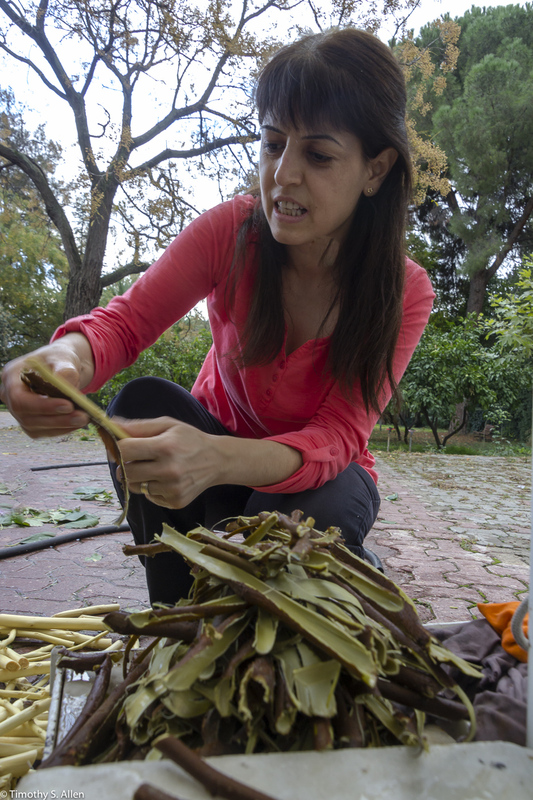 We gathered plants, cooked them, beat them to a pulp and then formed many sheets of handmade paper to discover what great paper we could make from the different plants of the Laguna de Santa Rosa area around Heron Hall. 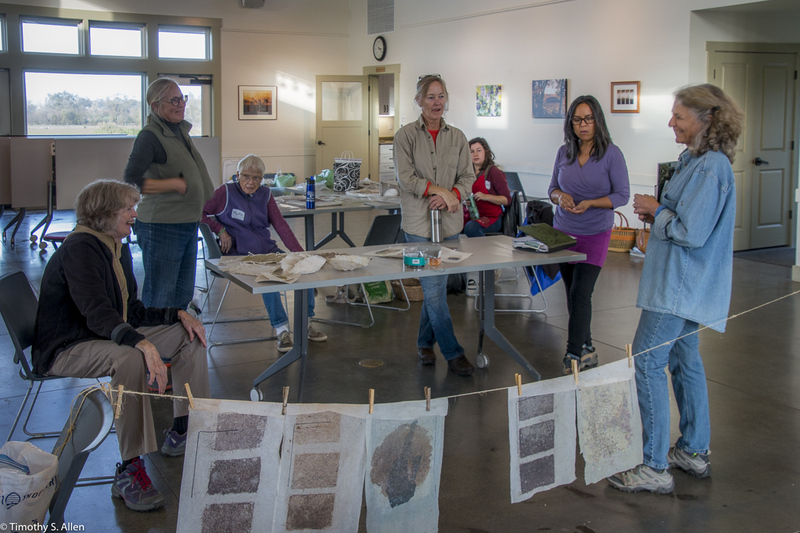 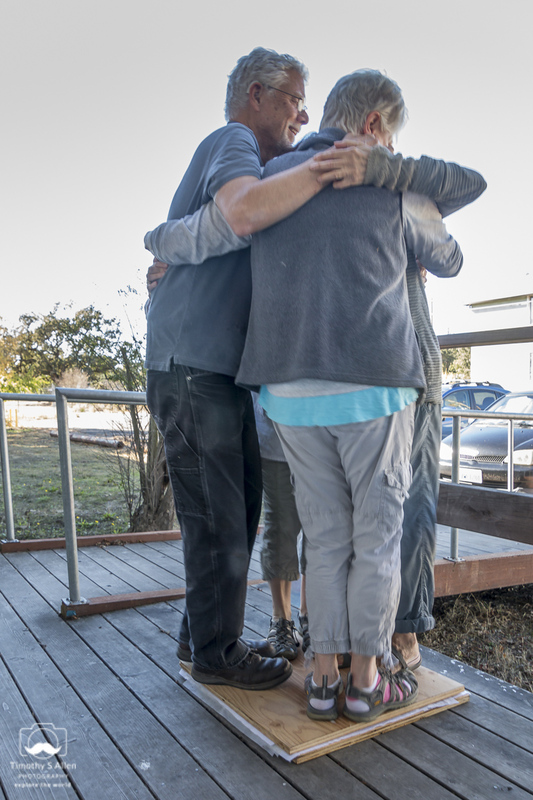 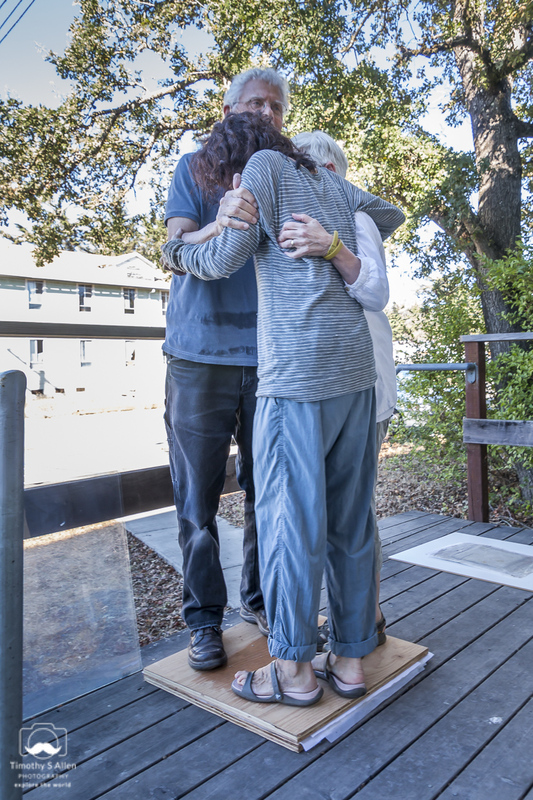 It was a great workshop, and thanks to the Laguna de Santa Rosa Foundation and all the very creative participants! 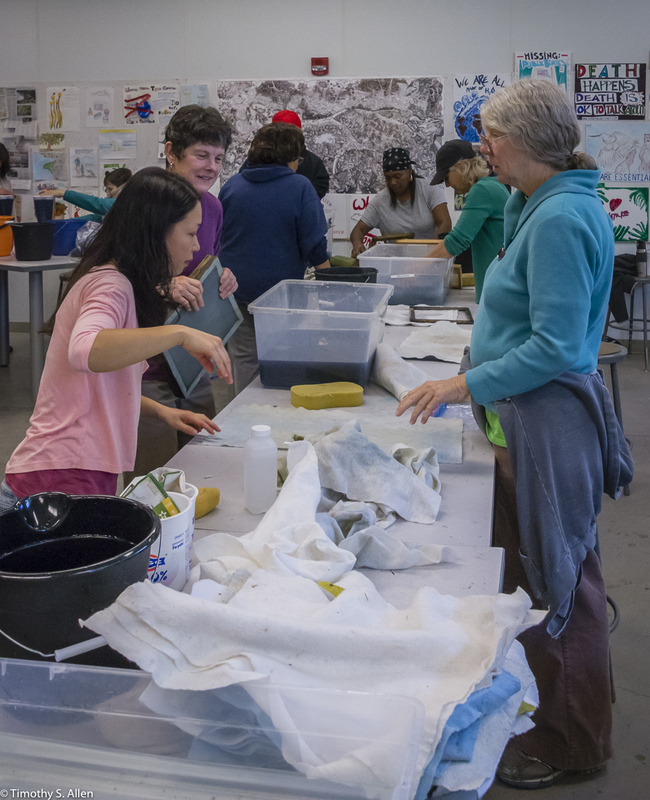 It was great to have the help of students at Laney College, Oakland, CA, to make paper for my eco art installation at the 2016 Bioneers Conference in San Rafael, CA, at the Marin Center Oct. 20-23. 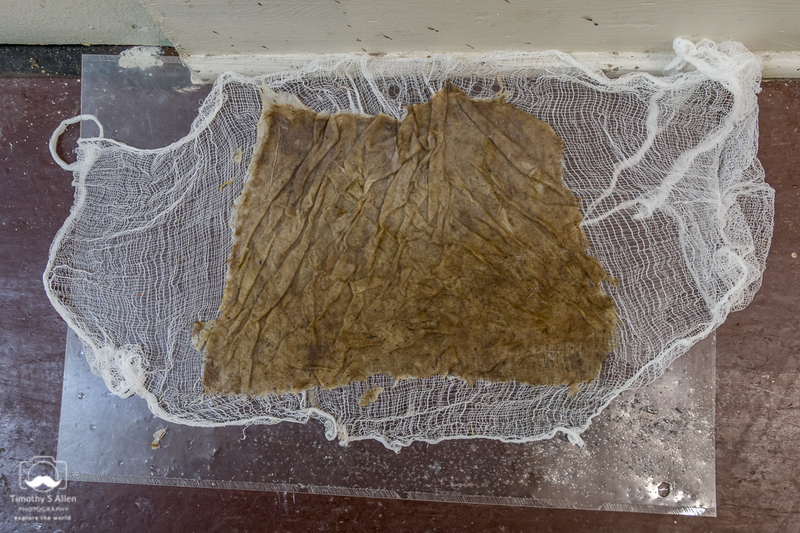 My art installation is part of the WEAD exhibition (www.weadartists.org) at this environmental art conference. 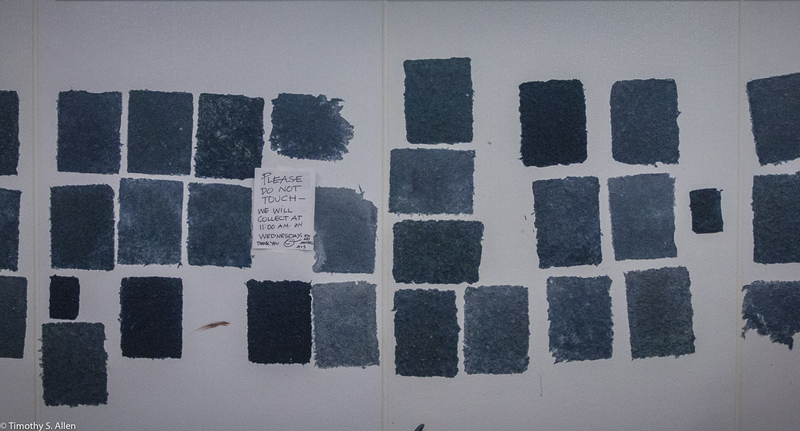 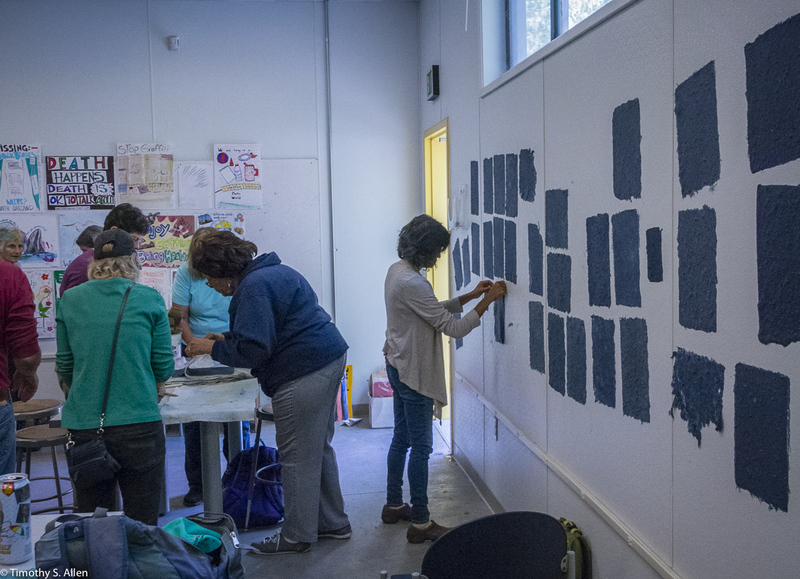 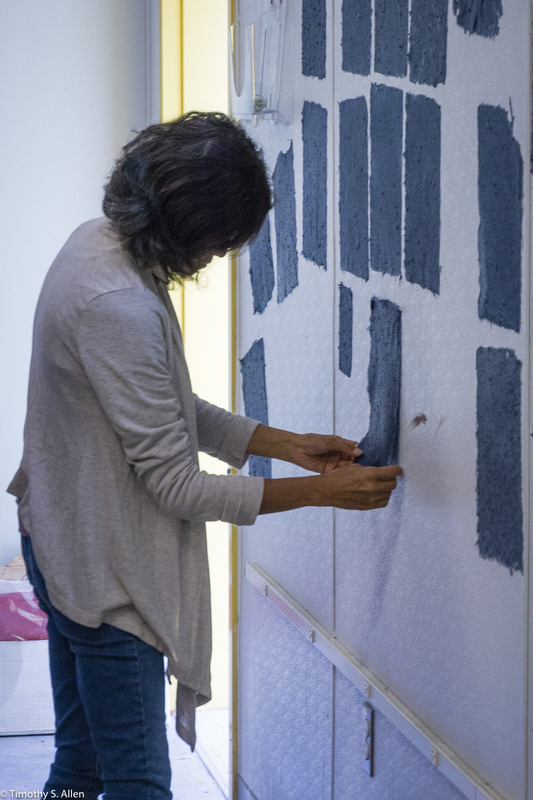 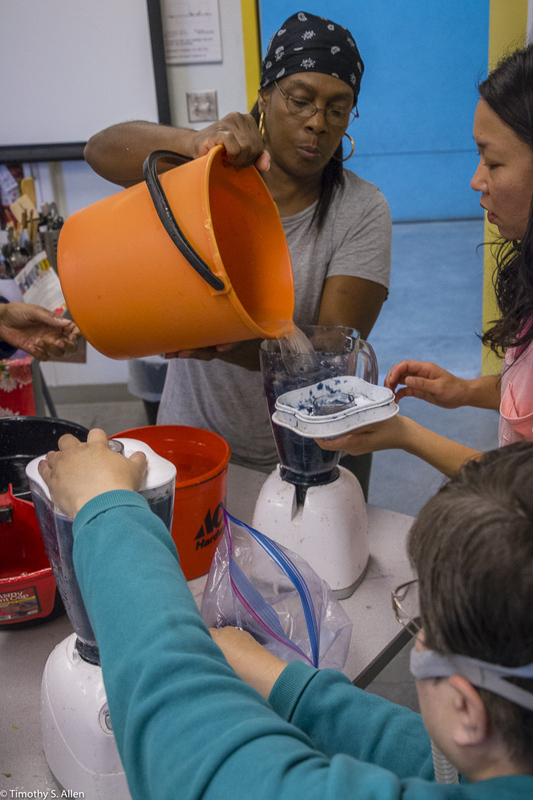 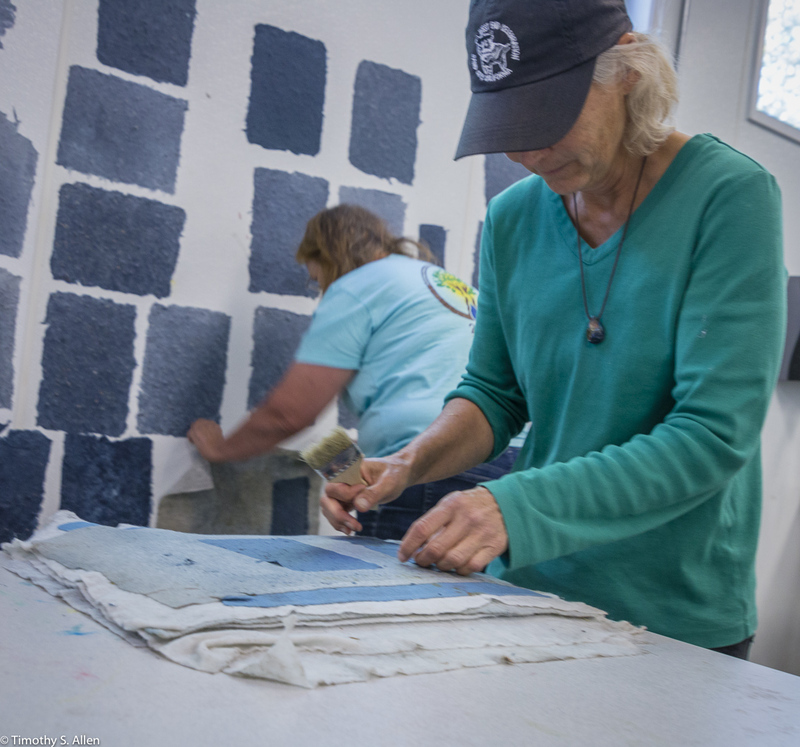 On Tuesday Oct. 11, the students in the Laney College Eco-Art Matters class made many sheets of blue handmade paper using pulp from old blue jeans. 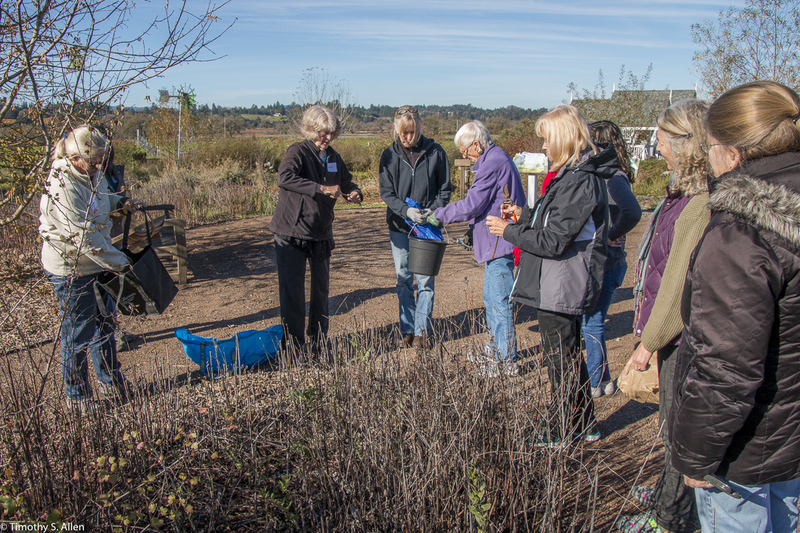 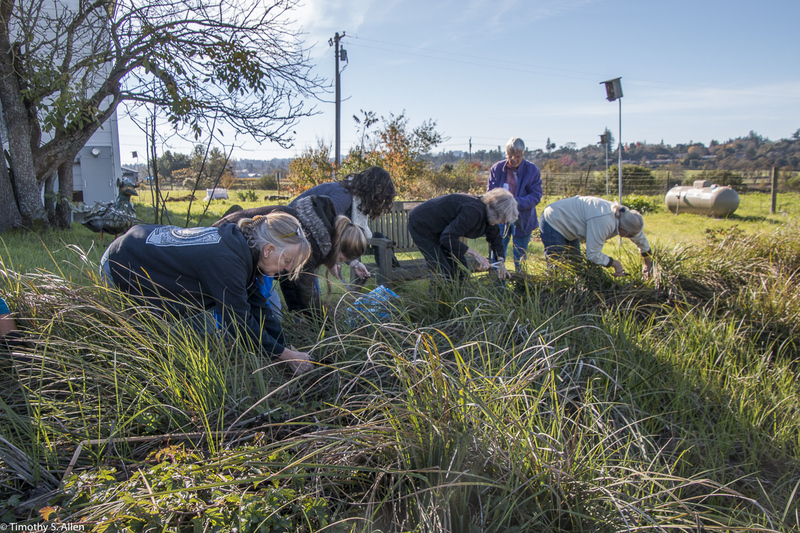 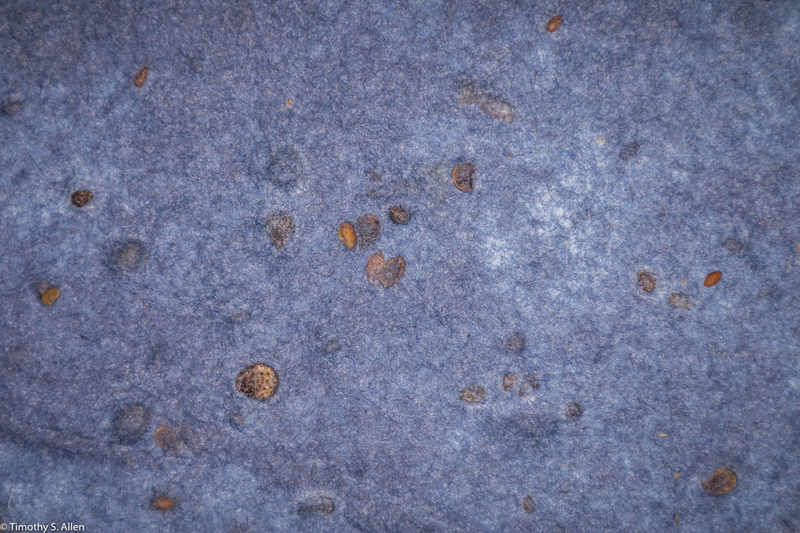 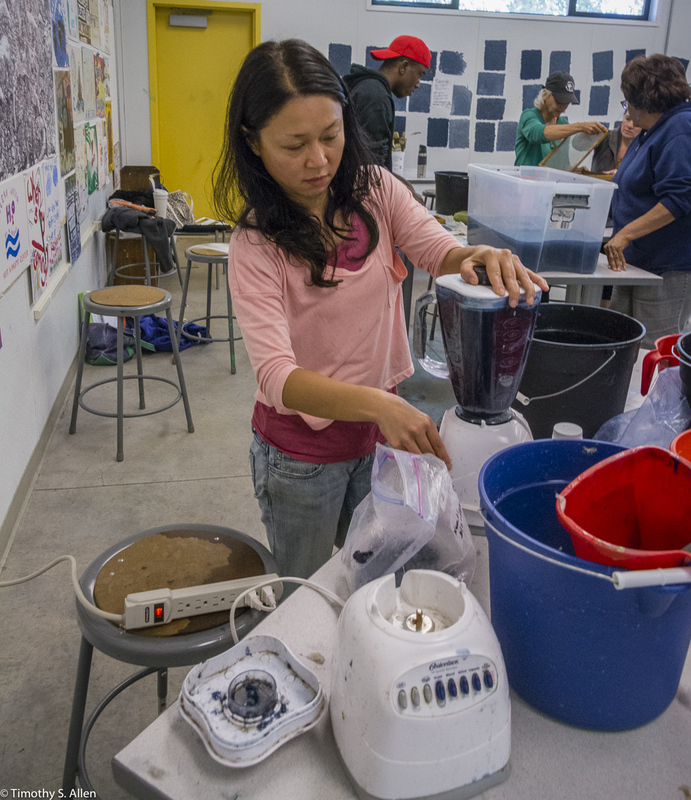 The blue pulp also has seeds for blue wildflowers in it, and the students will shape the blue seeded paper into hundreds of water drops to install on a wall at the Bioneers environmental conference. 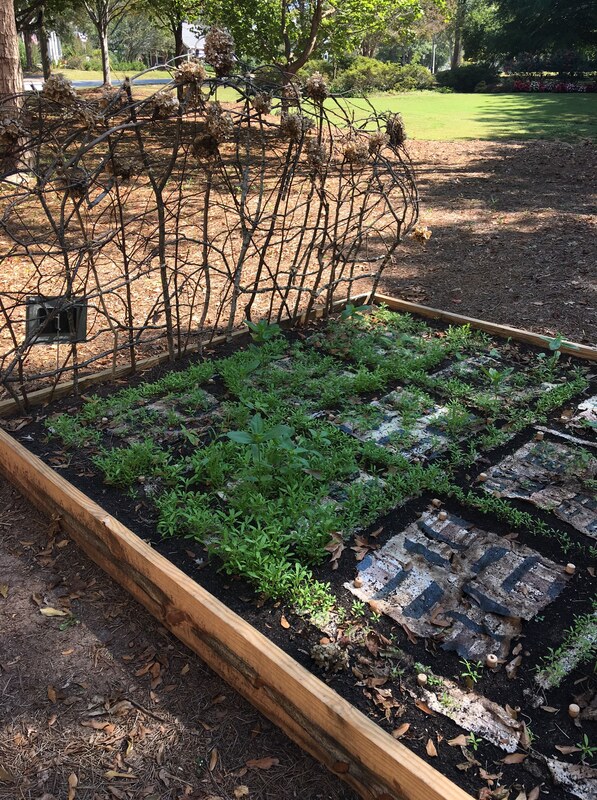 Thanks to the class instructors Andree Thompson and Sharon Siskin and to all the students who helped with this installation. 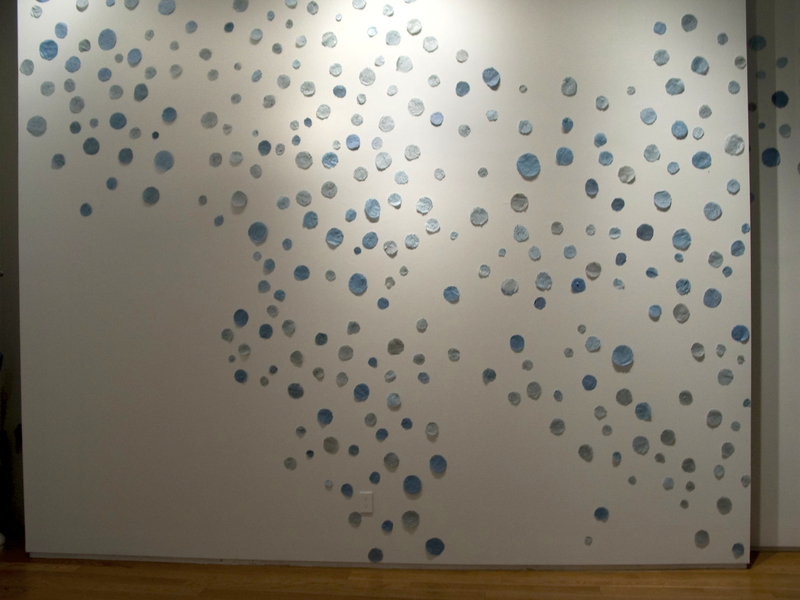 My installation is called “Every Drop Counts” and aims to raise awareness about the importance of conserving water. 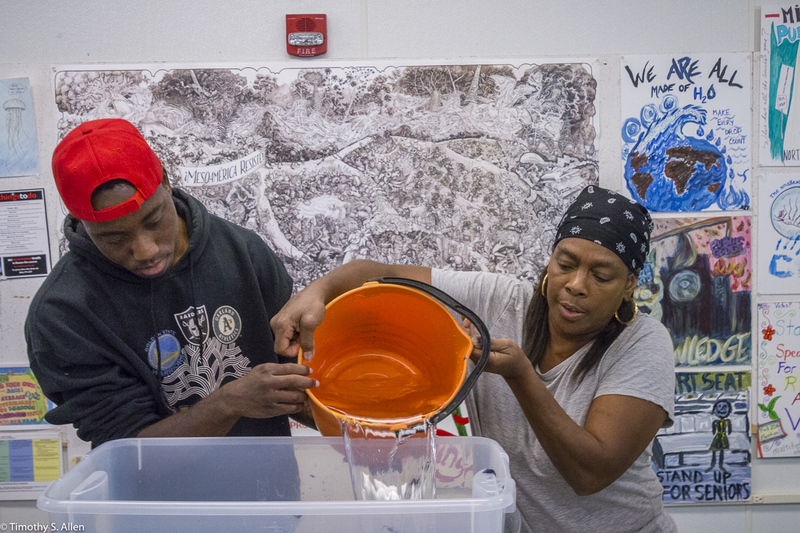 Visitors at the conference will be invited to take a drop from the installation and make a pledge to conserve water. 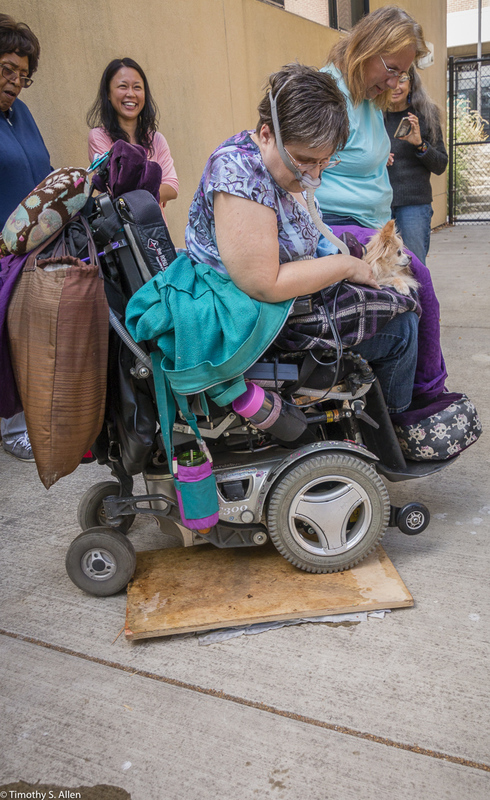 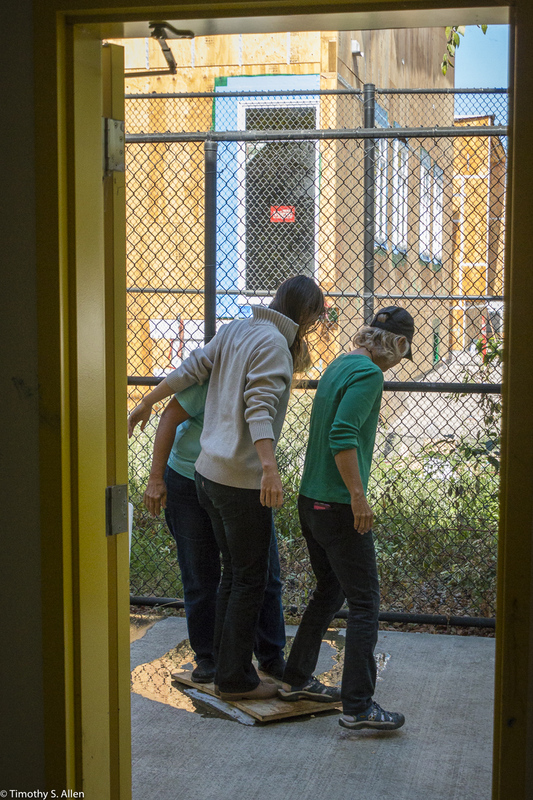 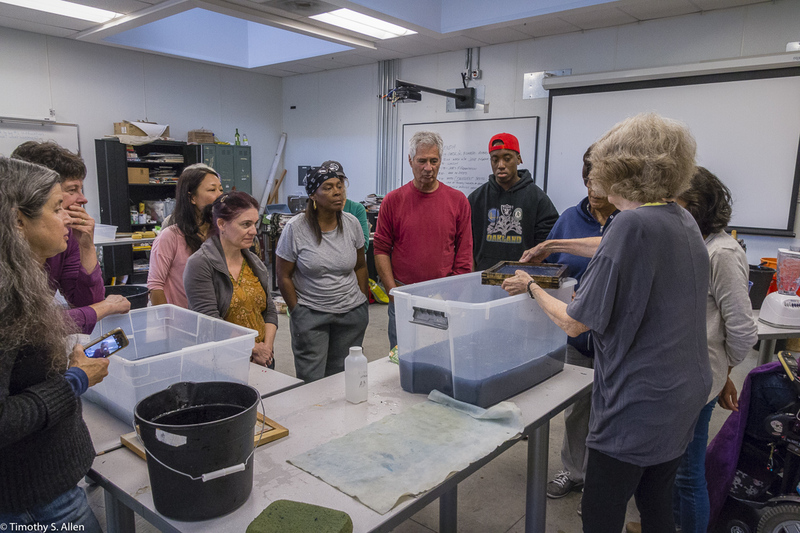 Here are some photos taken by my husband Timothy S. Allen at Laney College on Tuesday October 11 during the papermaking activity. 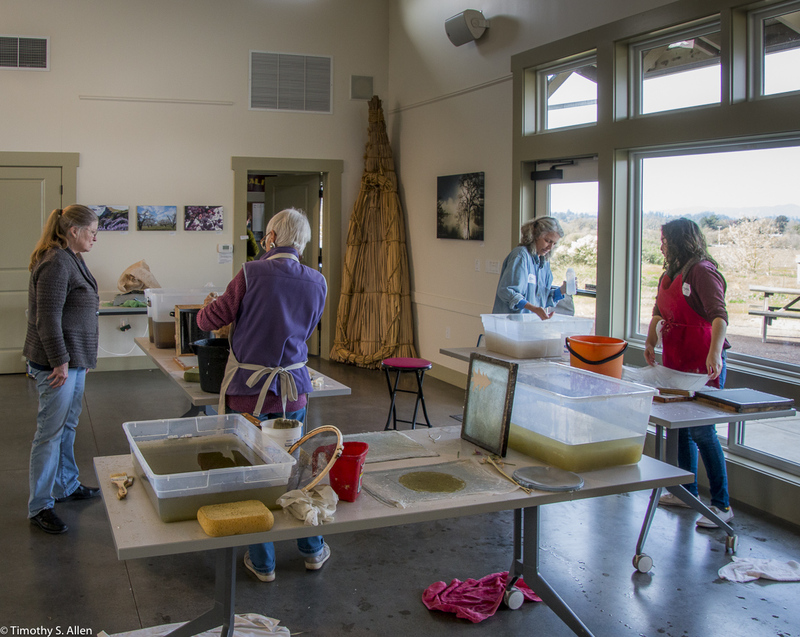 Check back here later for photos of my “Every Drop Counts” installation at the Marin Center, San Rafael, CA, during the 2016 Bioneers conference Oct. 20-23, 2016.
to be held Oct. 21-23 at the Marin Center, San Rafael, California. 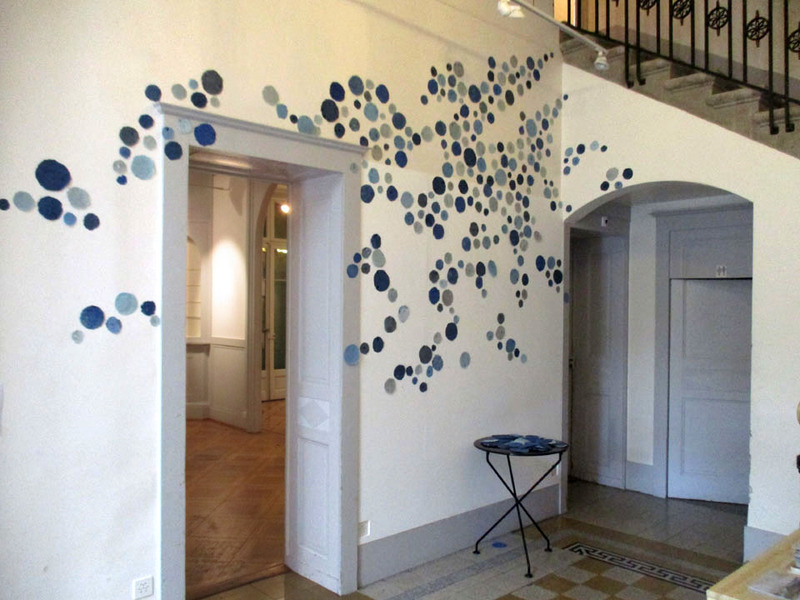 I will present an interactive installation called “Every Drop Counts”. 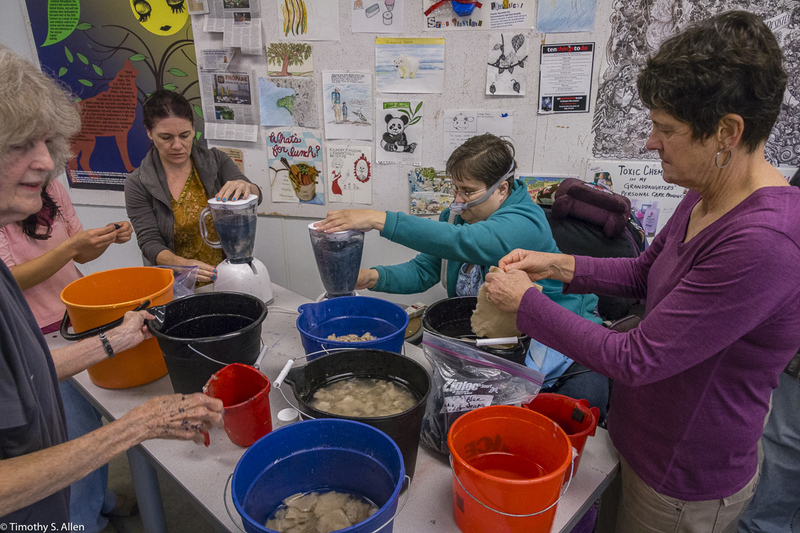 For the 2016 Bioneers conference, the WEAD (Women Eco Artists Dialog) organization (www.weadartists.org) is organizing an art exhibition about “Reciprocity” with an environmental theme showing how art can contribute to more public awareness of environmental issues such as water conservation. 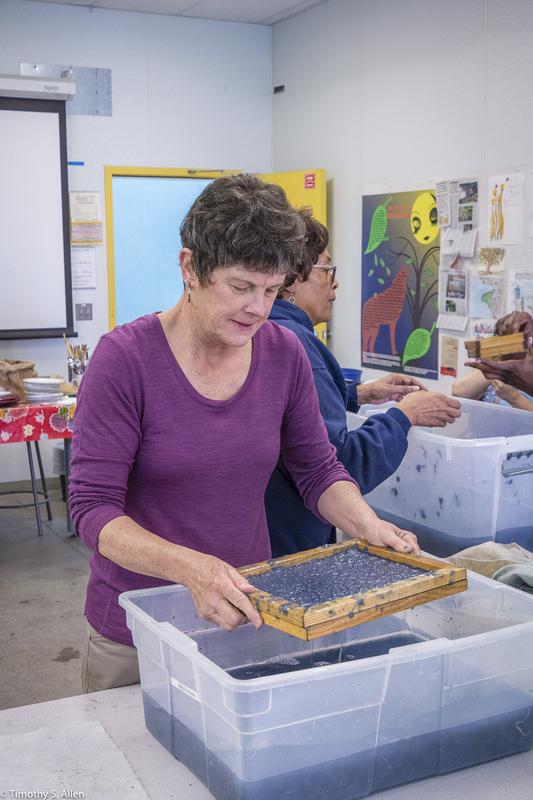 I will go to Laney College, Oakland, on Tuesday, October 11 to work with the art class “Eco Art Matters” to create hundred of handmade paper “drops” using blue paper pulp made from old blue jeans and other recycled paper with seeds for blue wildflowers in the pulp. 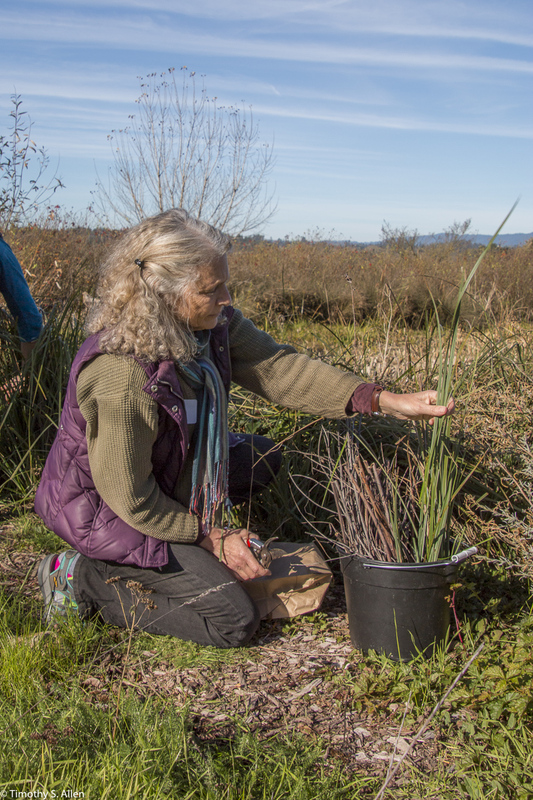 At the 4 days of the Bioneers Conference Oct. 21-23 at the Marin Center, San Rafael, the installation will be displayed and visitors invited to make a pledge to conserve water and take a “drop” from the installation home with them to plant and water until it transforms into blue wildflowers….or save the “drop” on the refrigerator to remind them to conserve water. 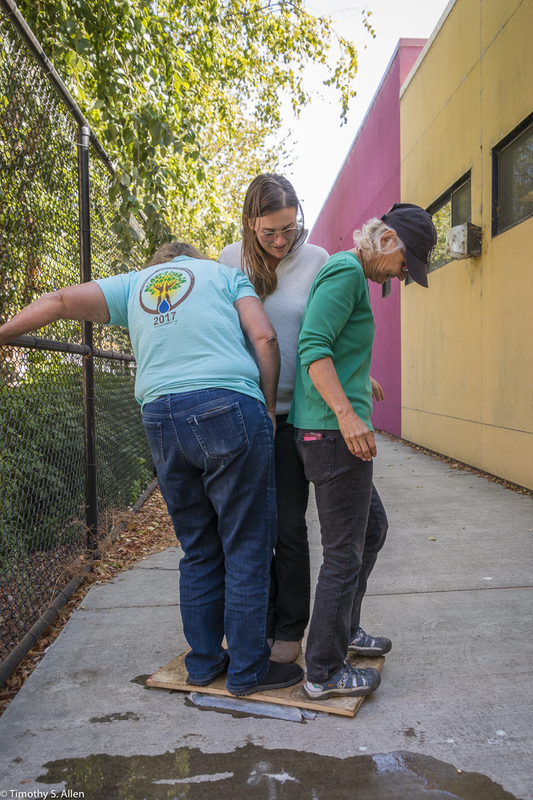 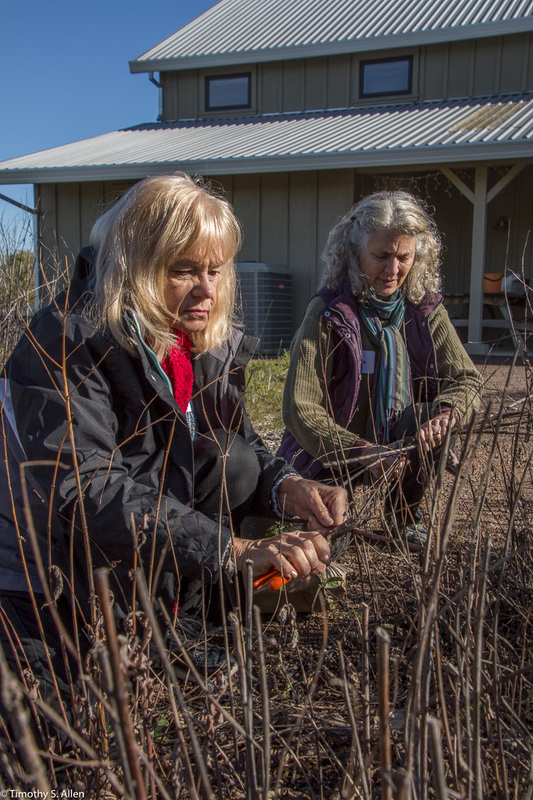 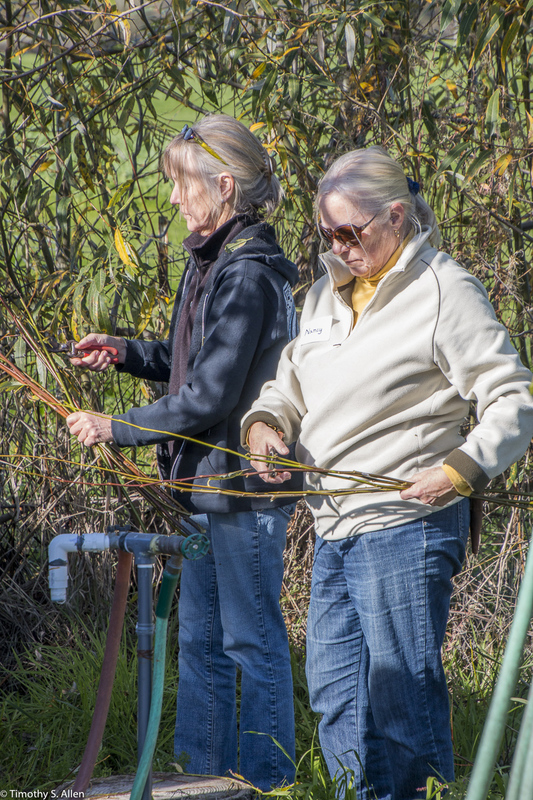 Lack of water is one of the most pressing problems in northern California in the last few years because of prolonged drought and global warming effects. 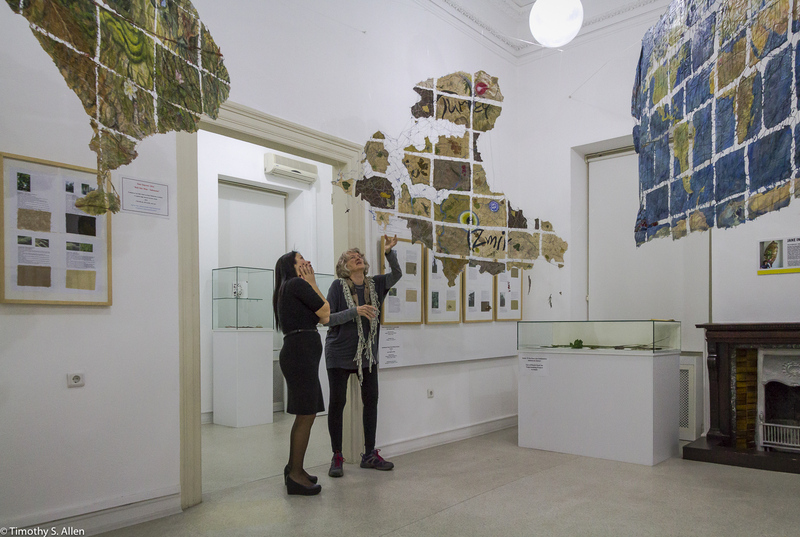 Water is a concern all over the world, and this installation has been shown in several other venues…it has been in a NYC gallery, in a gallery in Geneva, Switzerland, as well as at a university gallery in Taiwan. 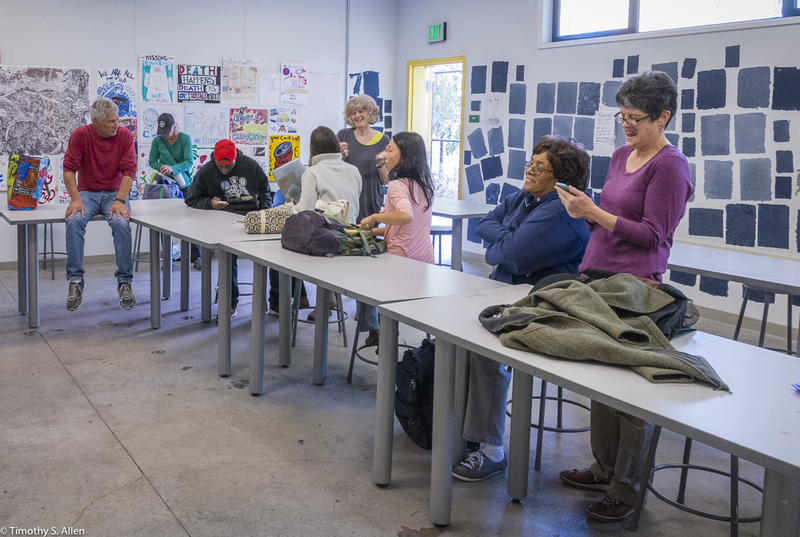 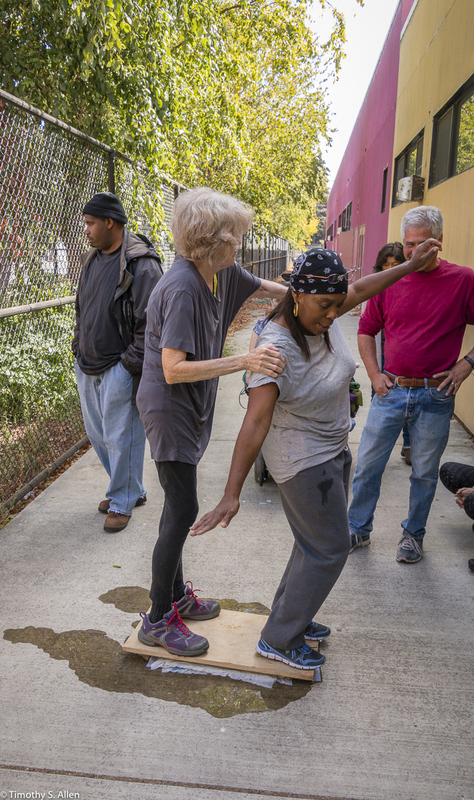 This will be its debut in California with new drops being made at the Laney College class and maintained during the conference by Laney College students and the two art professors (Andree Thompson and Sharon Siskin). 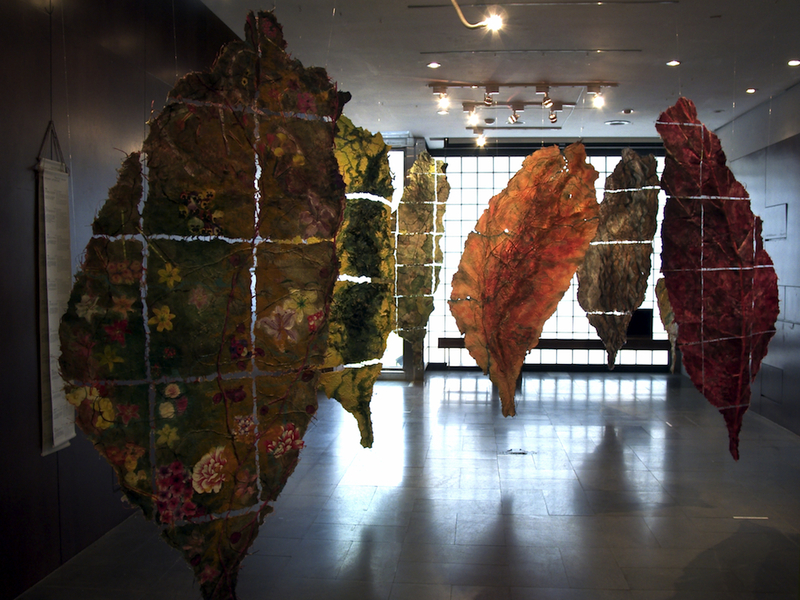 Here are some photos of the installation in New York City at Tenri Gallery in 2009 and in Geneva, Switzerland at the Villa Dutoit, for the Paper/Fiber Art Biennial in 2016. 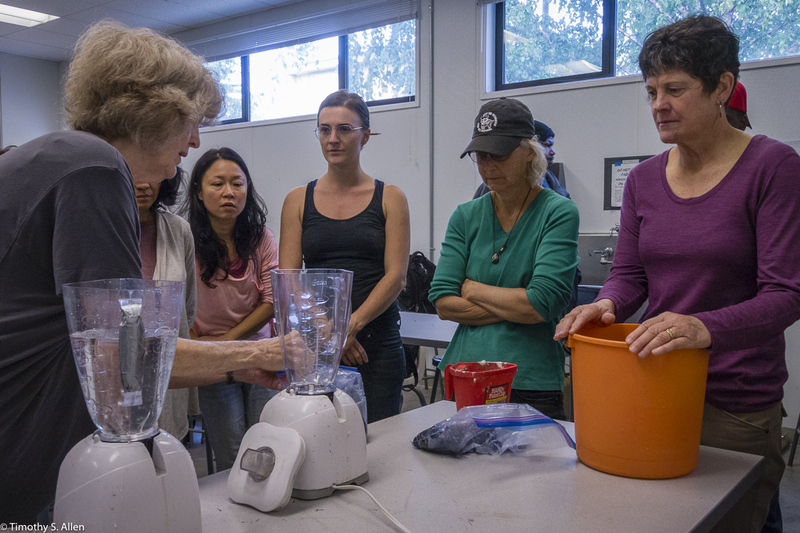 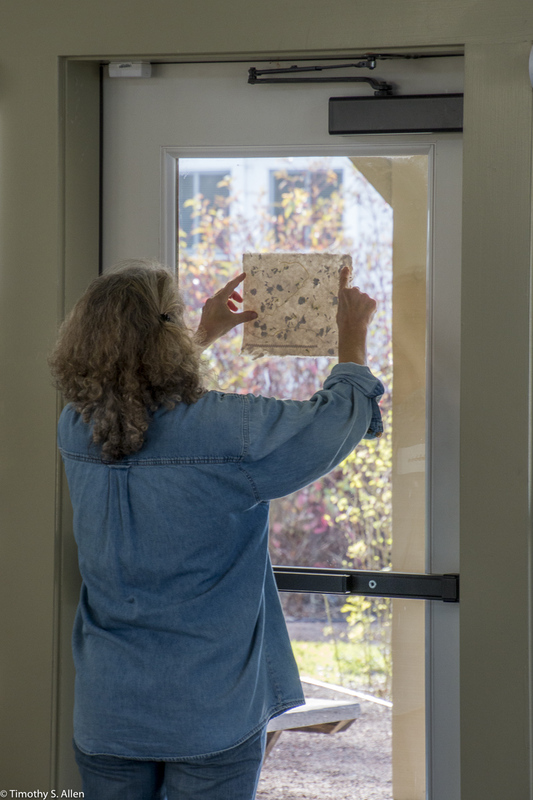 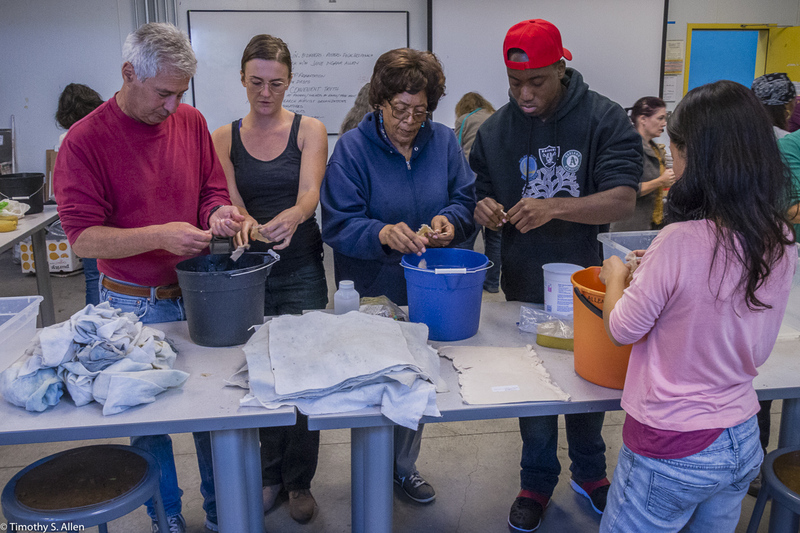 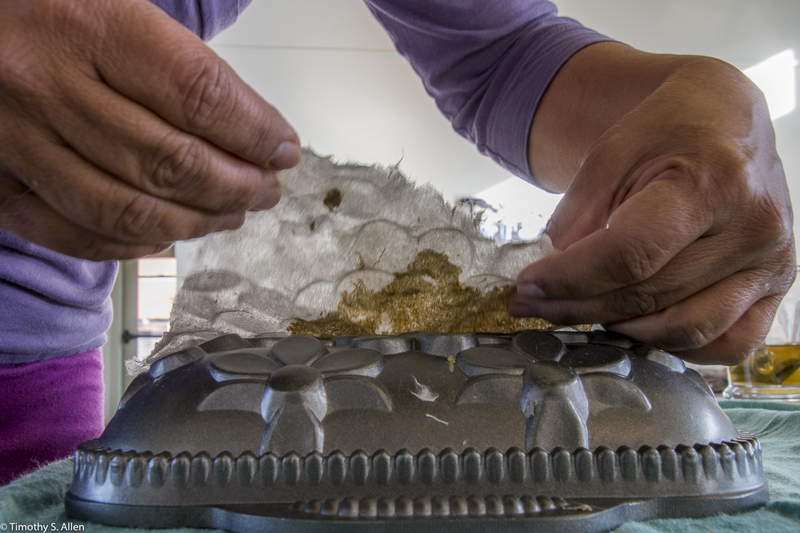 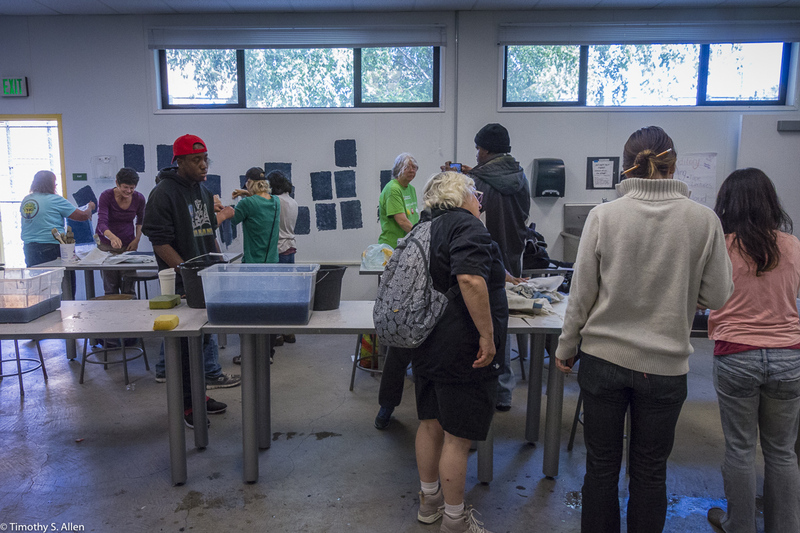 Check back here to see more photos of the papermaking workshop at Laney College on Oct. 11 and also to see the installation of “Every Drop Counts” at the 2016 Bioneers Conference in San Rafael, Oct. 21-23, 2016.